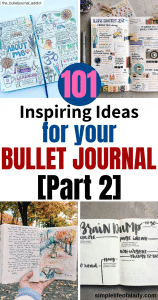 Welcome to the second installment of the Ultimate List of Bullet Journal Ideas! 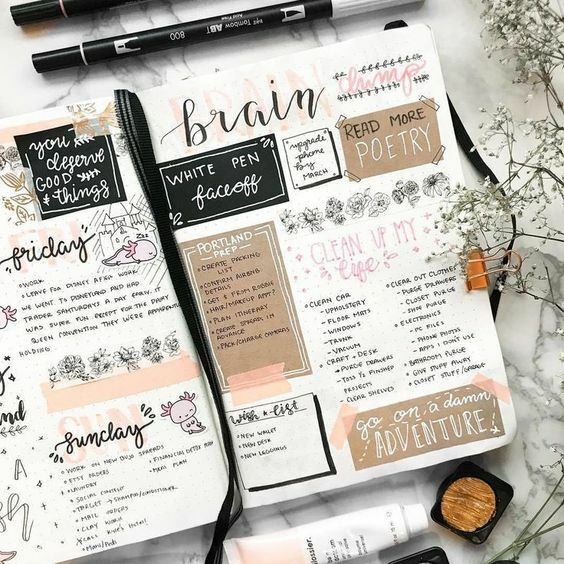 And now here are 50 more to inspire you and help you make your best BuJo ever! If planting is one of your hobbies, you will surely appreciate this. 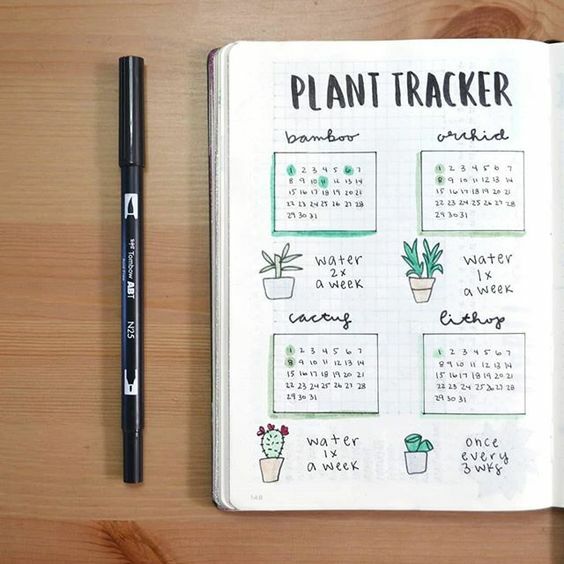 Monitor your plants and record your growing results using a plant tracker in your bullet journal. The Bible is a must read for every Christian. Not because it is a duty, but because it is a necessary part of life, and without which, the life of a Christian can never be complete. 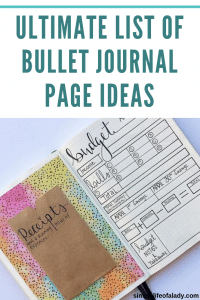 Bring with you the passages that you need to remember about a particular topic like Prayer or Overcoming Fear, by writing them in your bullet journal. 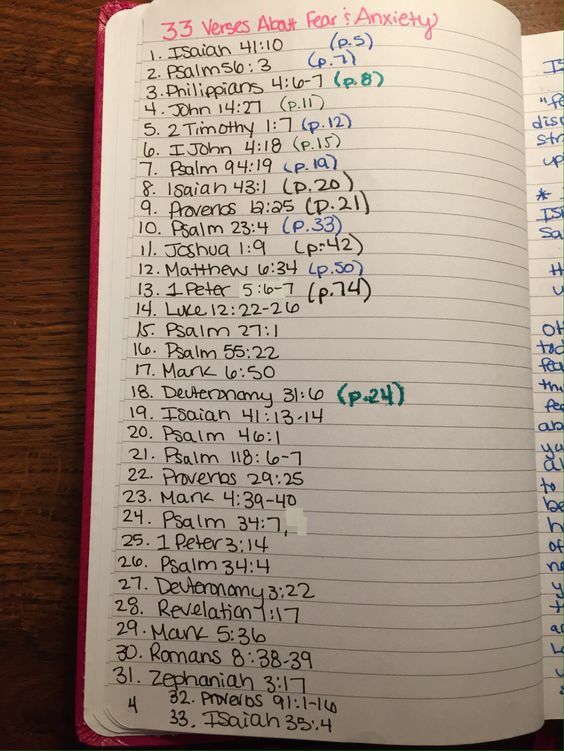 Either you list all the passages that discusses that topic or write the passages themselves, word for word, so that you don’t have to look up into the Bible when you need to remember them. 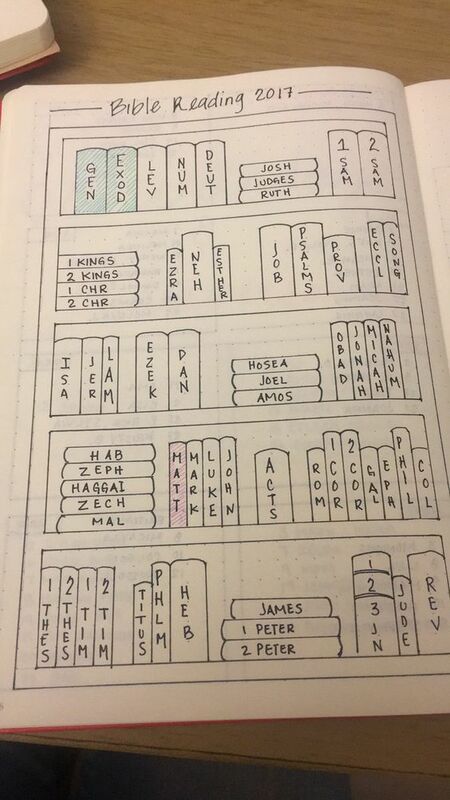 You can also make list of all the books of the Bible to keep track of which book you have completed reading and which ones you are yet to complete. 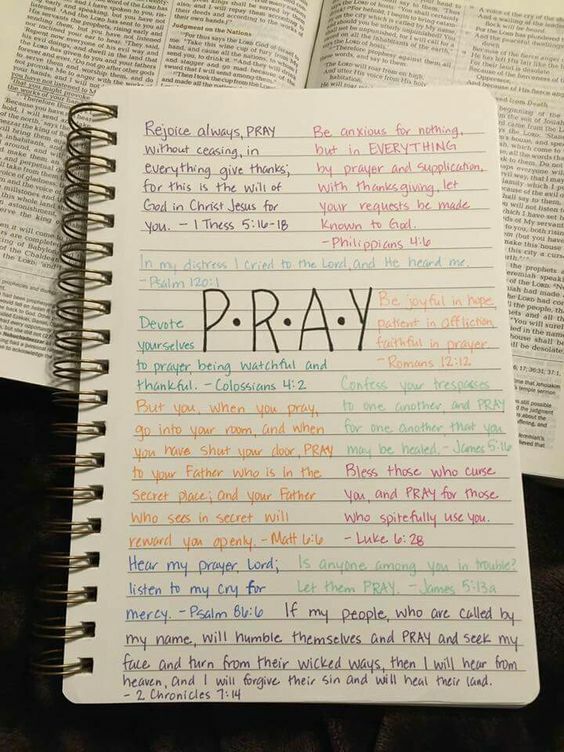 As Christians, we must strive to pray everyday. 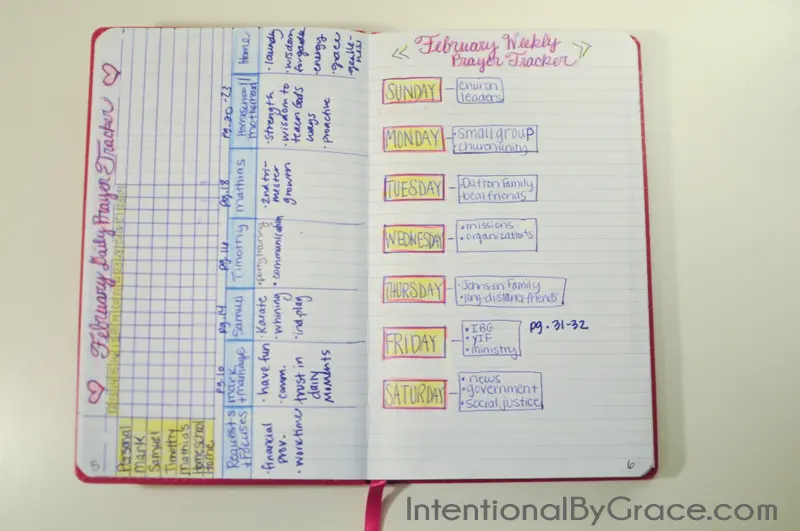 Yet again, because of the busyness of our lives, praying (just like reading and studying the Bible) is often pushed at the back of our schedule. 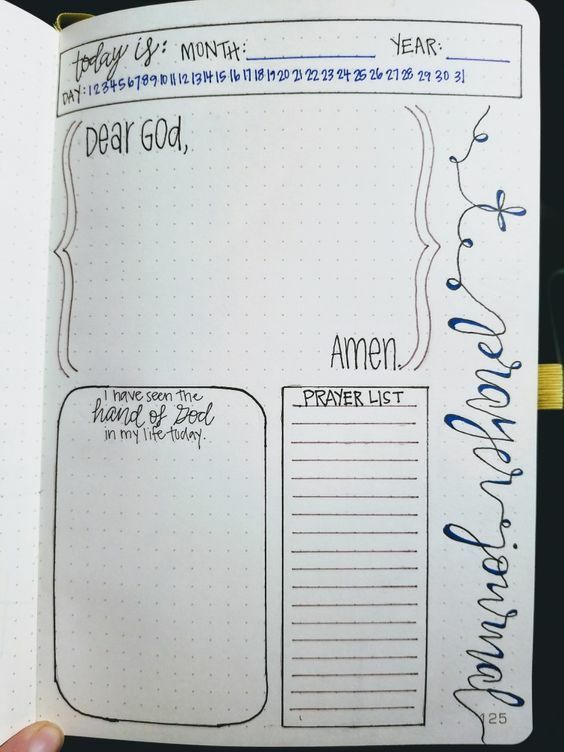 So a bullet journal page just for prayer is a wise move not only to prompt you to pray everyday, but also to keep track of what you are praying for. Tracking what you ask from God is important because too often, when we ask for something, we remember God. But when our prayers are answered already, we forget to thank him. Going back and reading what you prayed for reminds you of them and your duty to thank God when he answers them. It also shows you that you have a lot to be grateful for, knowing that what you have right now, was just a wish ‘once upon a time’. When we are inspired, it feels like there is nothing that can get in our way that we can’t handle. It feels like everything is possible. The problem is we don’t always stay inspired. There are moments when we feel down, tired and discouraged. This is why we appreciate quotes a lot! It may be a collection of sayings, or just one sentence that when we read, it reminds us that, Hey! it’s not so bad after all. You don’t have to sulk like that. 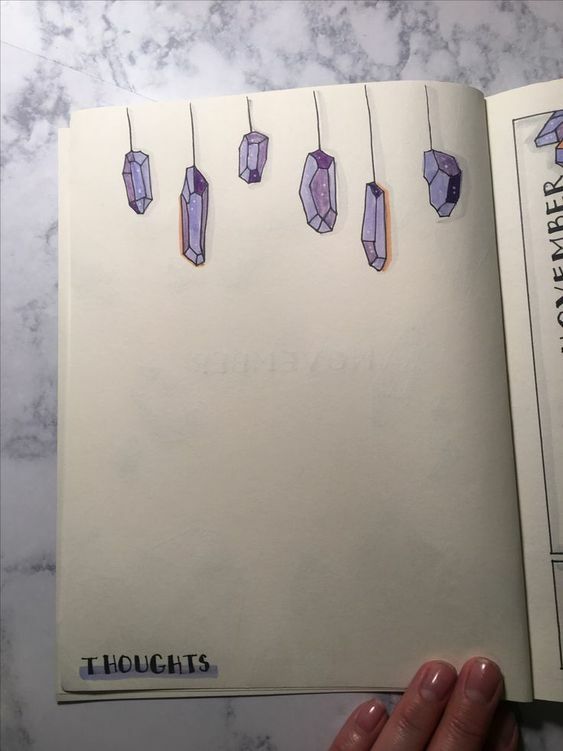 So it’s helpful to always keep those words handy in your bullet journal. 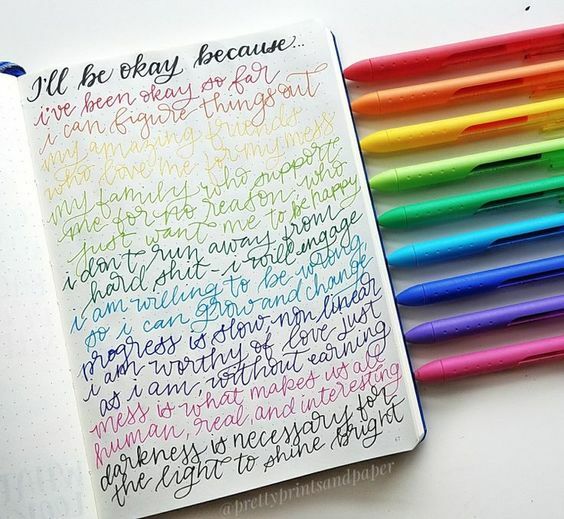 You may not always feel inspired, but with easy access to those words that inspire you, you’ll have greater chances to stay positive even if things don’t go as you expect. 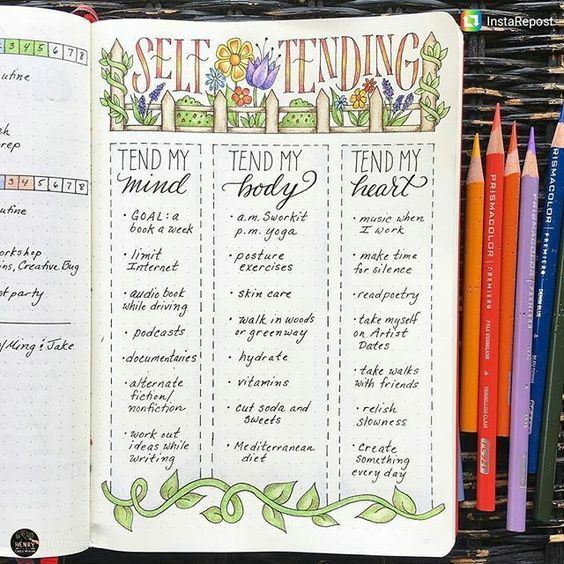 You can dedicate a whole page in your bullet journal for just one quote, or a collection of the best quotes that resonate with you. Here are more Pinterest boards to get either layout ideas or more quotes for your Quotes and Inspiration page. 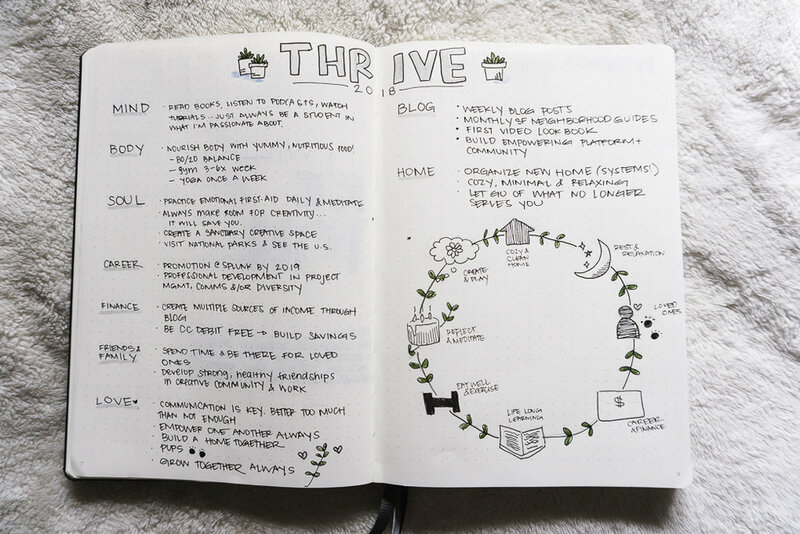 What does it take to live a thriving life? This page holds your answers. What guides your actions and decisions in life? Is it your values? Interests? anchors? your dreams? what people say? When you hit a crossroad, what will make you choose to go one way and not the other? 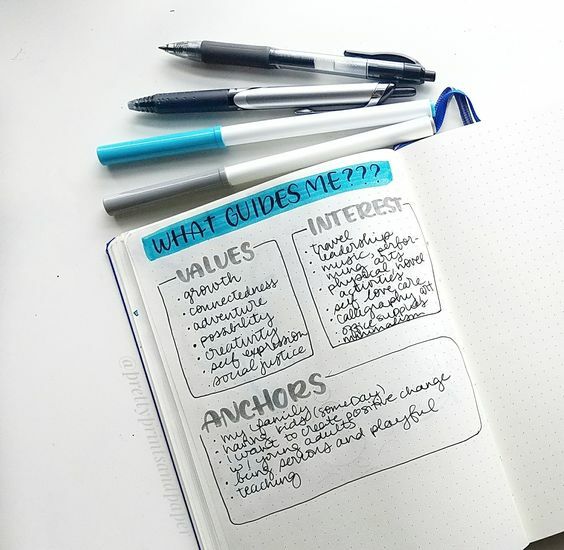 What Guides Me page helps to remind you of what’s important to you and why you do what you do. We live in a world of so many choices. Is your choice really yours? Or is it someone else’s? 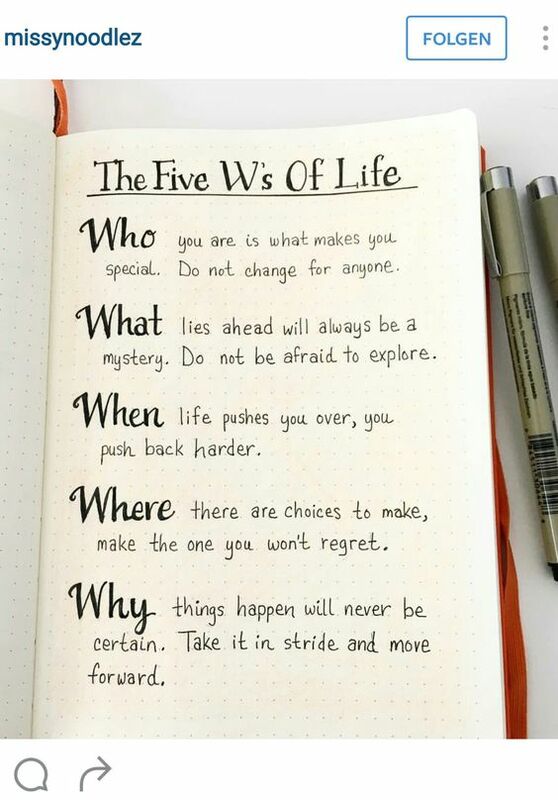 Write down your values, interests, anchors, dreams and anything that is important to you which can help you discern the best thing to do when you hit crossroads. When you have already achieved your goal and you don’t know what comes next, What Guides Me page can help you decide what to do. This can also be an alternative in making 5-year plans (if it’s not like you to make plans like these). On the other hand, it can be your guide in making those long term plans. Whatever it is, it always pays to remember the whys behind your actions, making your decisions are focused and you’re not doing something that is contrary to what you believe in. How often have you felt frustrated when you did not get what you want, only to realize later, that you really didn’t need it and you’d be fine without it? 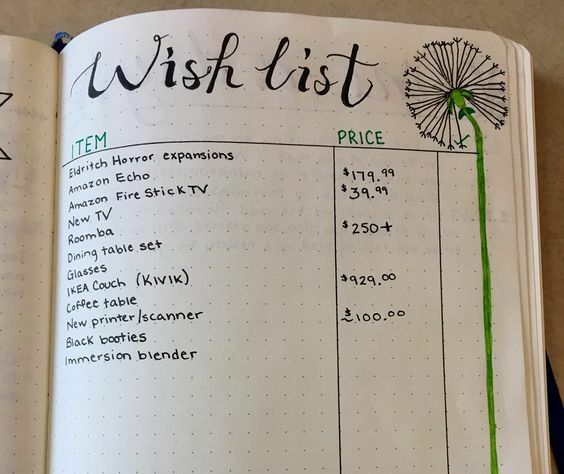 This is why it’s worth it to have a page where you can write down what you want and clarify whether it’s a legitimate need, or just a want – something that you can do without. When your resources are limited, like money and time, just focus on your needs; prioritize them. You can go on your wants later, when you have anything extra. 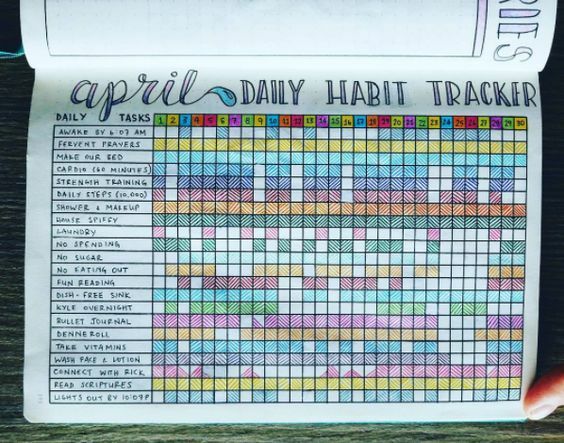 When you start a new habit, it doesn’t get automatic overnight. It takes at least 21 days to make it effortless. At the start of a new habit, you will feel excited. But as days pass by, the excitement that you once had slowly fades. That’s why forming a new habit is hard, and if you don’t put enough effort in it, you won’t succeed. 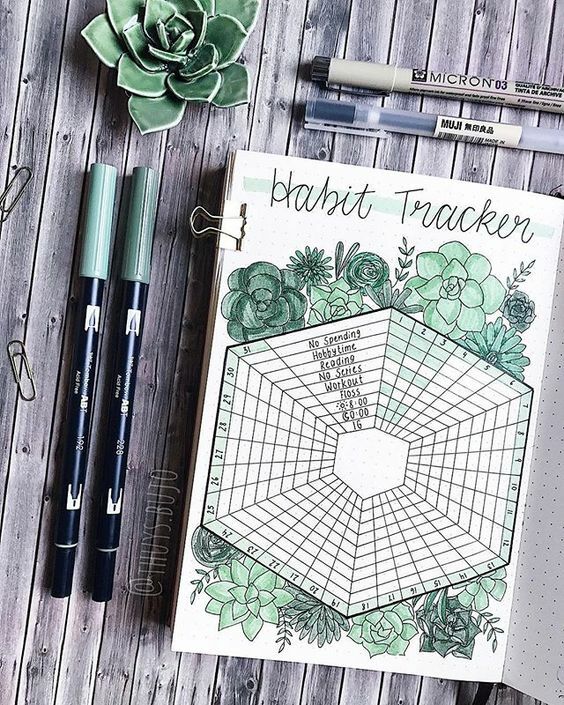 One of the ways you can help yourself to stick to it is by monitoring your performance using a habit tracker. 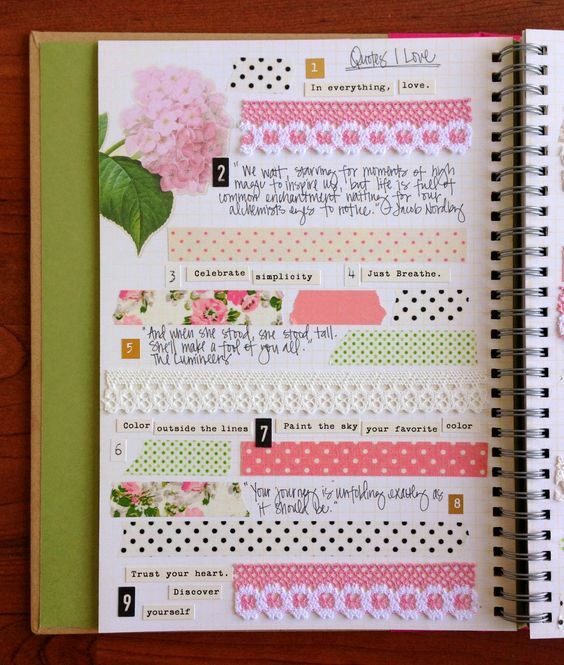 If it’s something that you have to do everyday, check the task or color the box, each time you do it. Stick it until you are already doing it everyday, without forcing yourself to. Once you reach this stage, it means that your habit has already been formed. 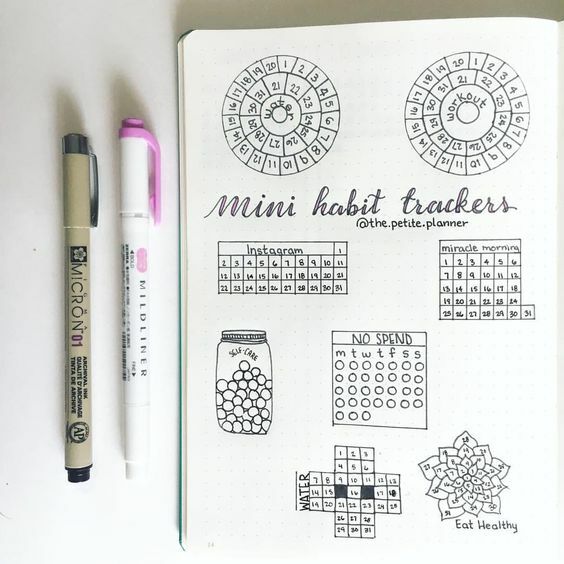 You may not include it then in your habit tracker anymore, because you’d do it anyway, even without tracking it. But if you still want it there because, you know, you might “slip” when you don’t see it anymore in your list, then by all means, do so. You can always do something new to improve your life. But we all need occasional reminders. 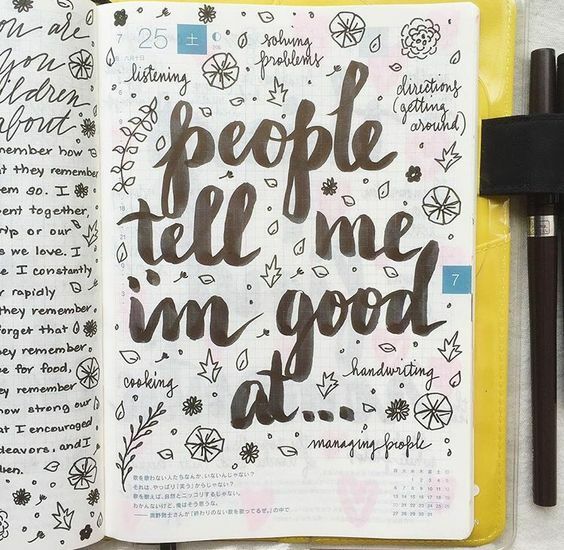 What better inspiring reminder is there than your BuJo pages? 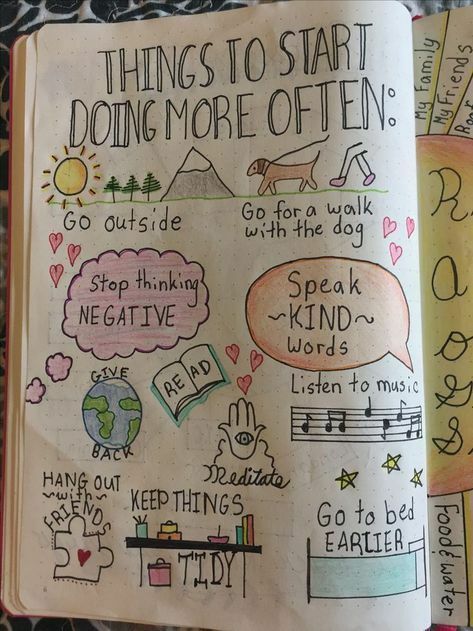 Write down at least five things that you want to start doing more often. Now slow down for a bit and think about the modifications you need to do to your daily routine to give room for these activities. You don’t have to start doing everything altogether. Think of this long term. 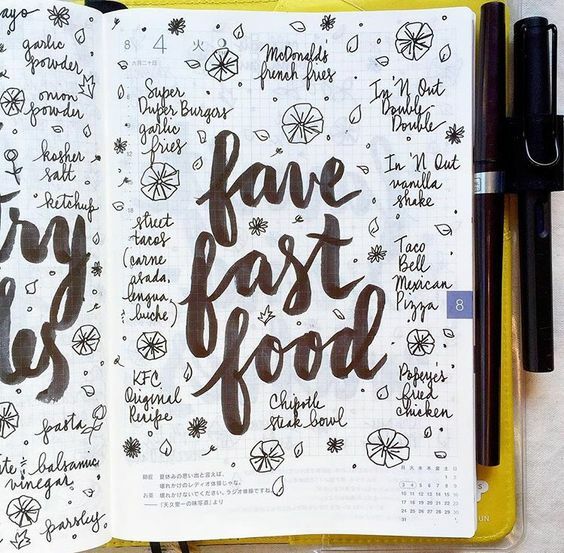 You can start with just one, then focus on turning this thing into a habit. Focus on doing it consistently. After a few weeks, it will be effortless to do it. 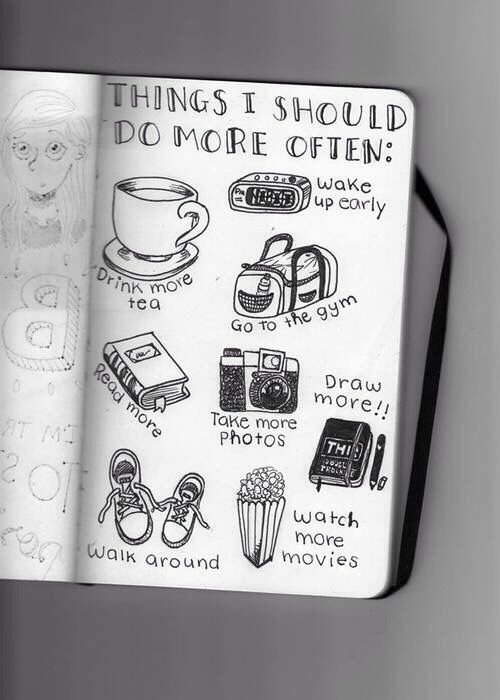 Then add another one and just repeat the process, until you are already doing everything in your list… effortlessly. Once you stop learning, you die. Whether it’s as simple as making a cup of coffee or as complex as coding numbers in computers, you can always learn something new. 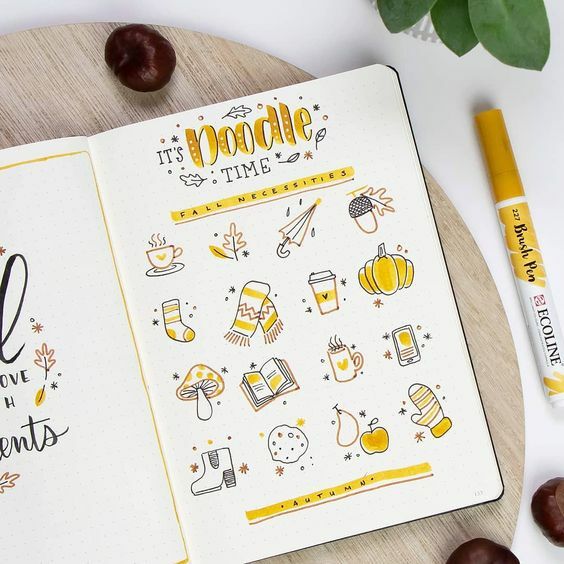 Not only does it make you more knowledgeable about the things around you, but it also adds to the spice of life when you are constantly learning. 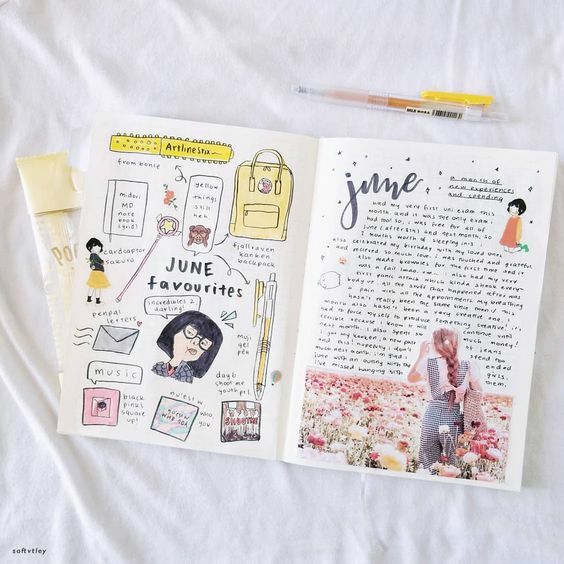 So jot down the things you are interested to learn in your bullet journal, and just like a bucket list, study them, then check them off, one by one. If the image doesn’t work, click HERE to sign up! 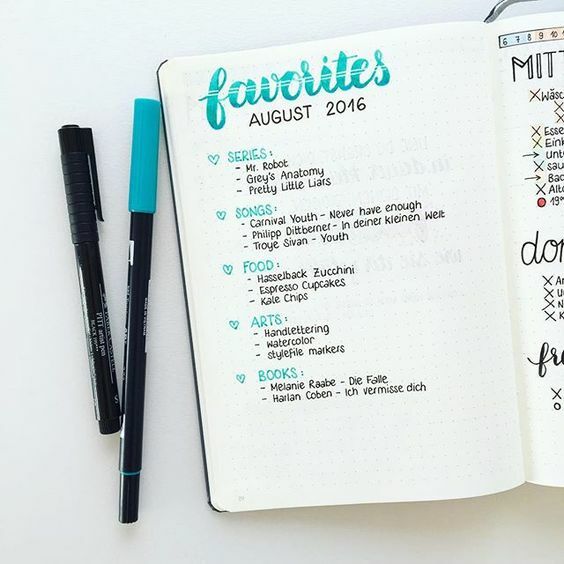 Never fall short of ideas by listing them all in your bullet journal. Then when you need a little boost, you know just where to refer. Refer to these boards for more ideas. 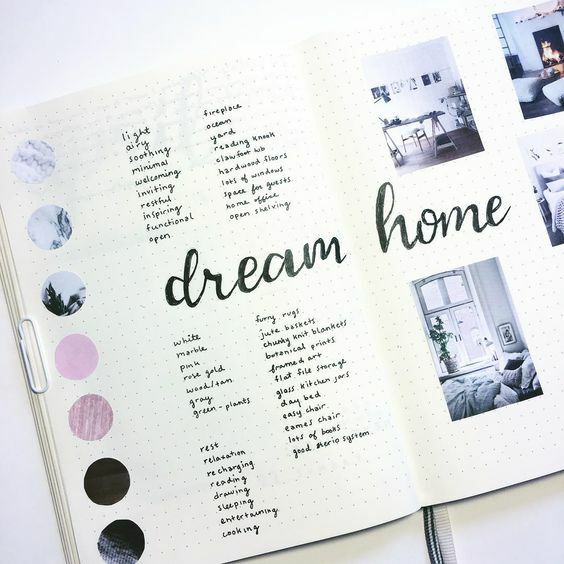 It can be a collection of your every favorite – songs, books, places, food, restaurants, movies, flowers, arts, actors, actress, people, designs, etc. But what’s this list for? You can use this for reference in the future. Perhaps you need to redecorate your home and and you’re thinking of a new theme for it. Or you want someone to know you better. Or a friend wants to give you a gift that you really want! Or it can simply be an appreciation of the wonderful things you’ve experienced in life. Have you ever heard the song My Favorite Things? It was sung by Julie Andrews in the classic movie, The Sound of Music. 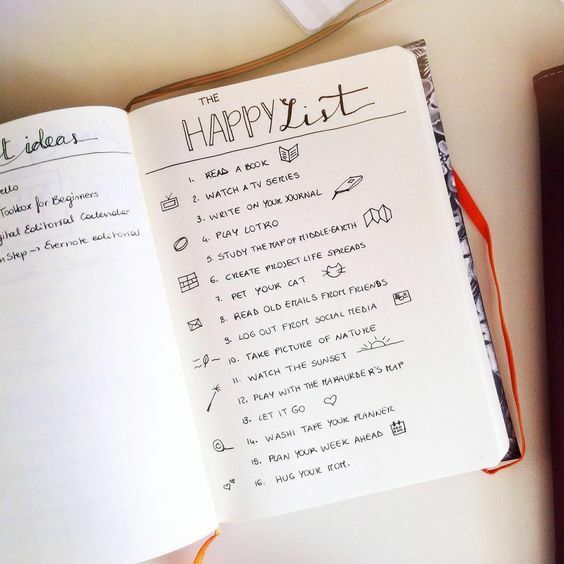 A Happy List works pretty much like that. 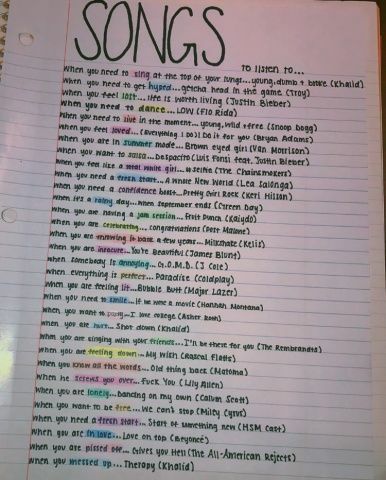 Then when you’re feeling bad, you simply think about this list and you won’t feel that bad anymore. Of course you can include in it things that you love doing like watching a movie or watching the sunset. 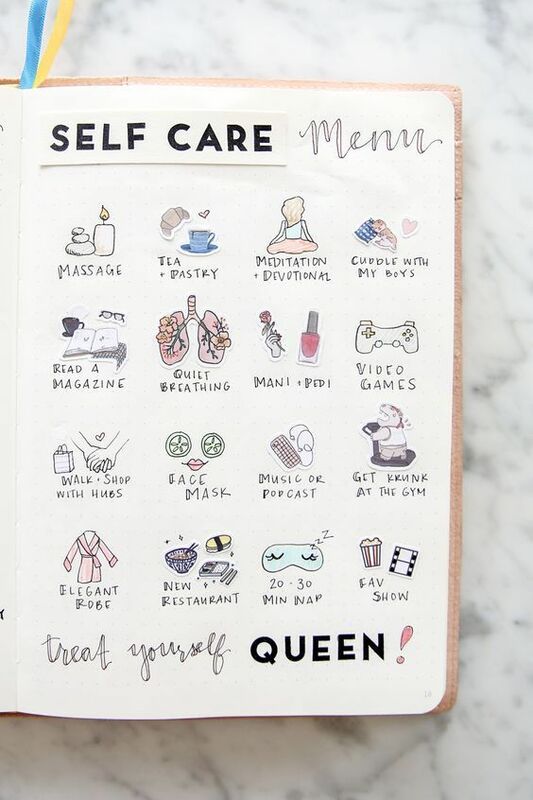 And this is why you might think that it’s just like a Self-Care Ideas List. 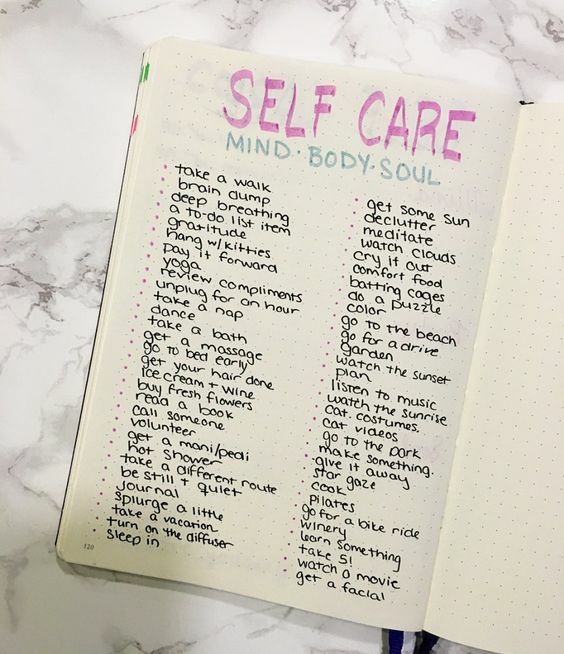 Well, it may look like it at first, but in a self-care list, the things in it are actually those that you have to do to make you feel better. You can not just write stars, or raindrops, or cats. 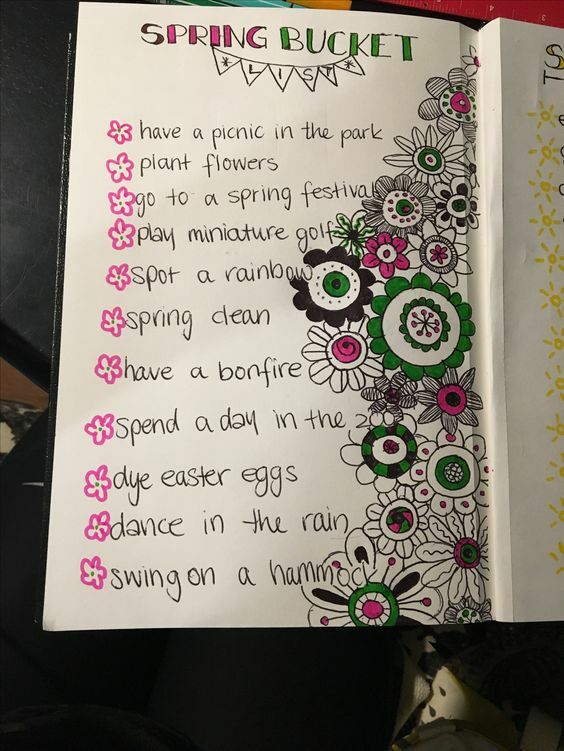 So you can say that one of your self-care ideas is to think about your Happy List. Think of everything you are grateful for. 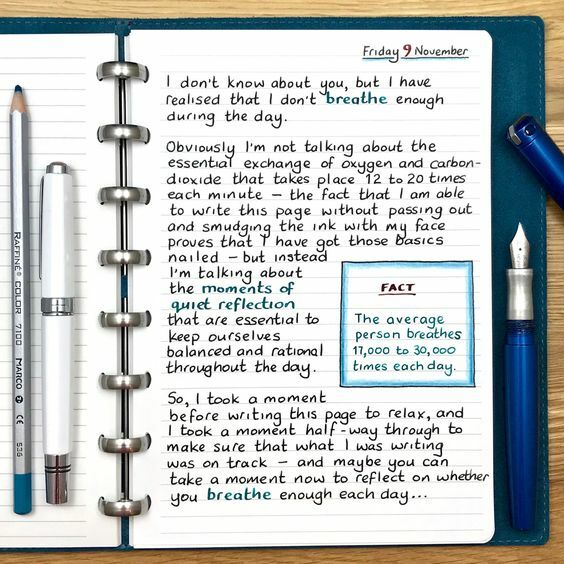 Every person, thing, memory, experience, place, everything that you are thankful for – write them on this page. Then when you feel like nothing right is going on, or things are not going as you expected, go to this page and remind yourself that despite everything that’s happening, you’ve got a lot to be thankful for. 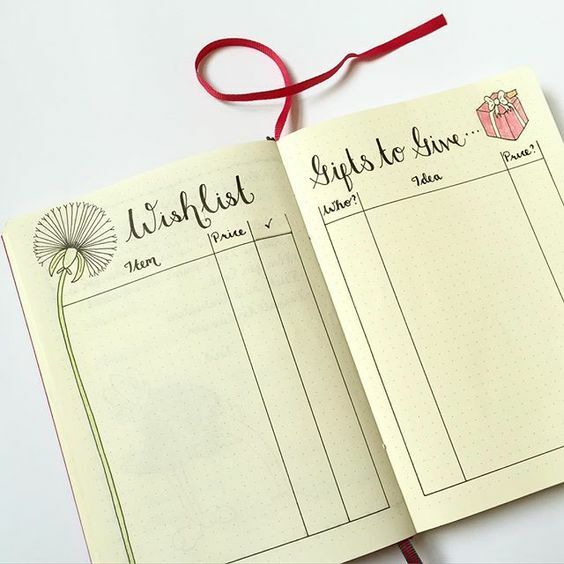 While you can always have a gratitude list, it doesn’t hurt to add more to that. 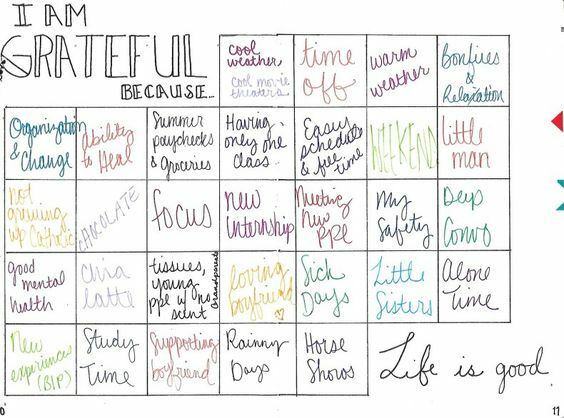 A gratitude log lets you write what you are grateful for everyday. 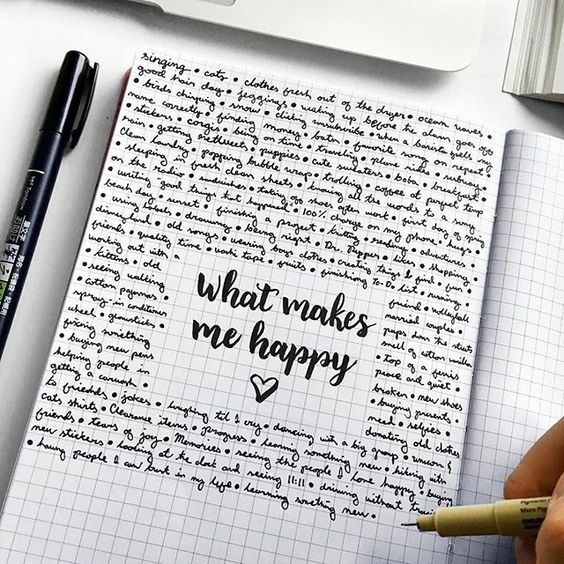 Think of one thing you are grateful for during the day, and write it down. 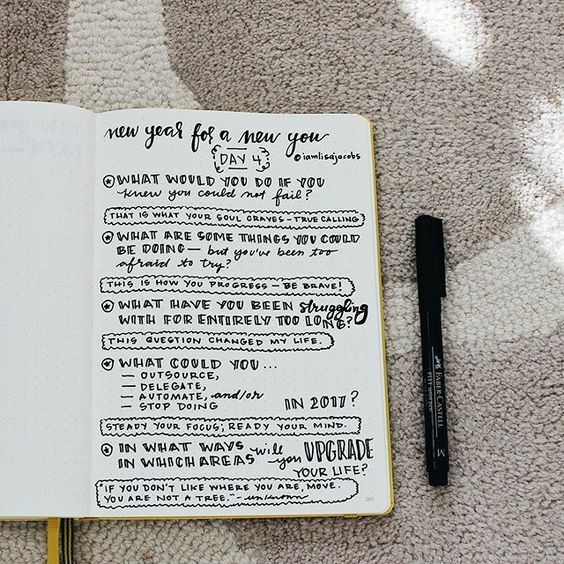 Review your gratitude log anytime you want, and especially when you’re feeling down. 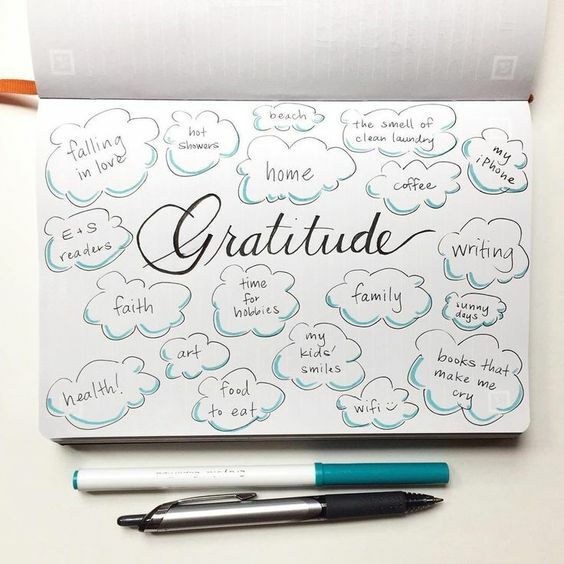 If you maintain this habit for a year, at the end of the year, you will have written 365 things to be grateful about. And when you count your blessings regularly, you’ll find that at the end of the year, you’re a much happier and more grateful person. Don’t we all want to be someone like that? 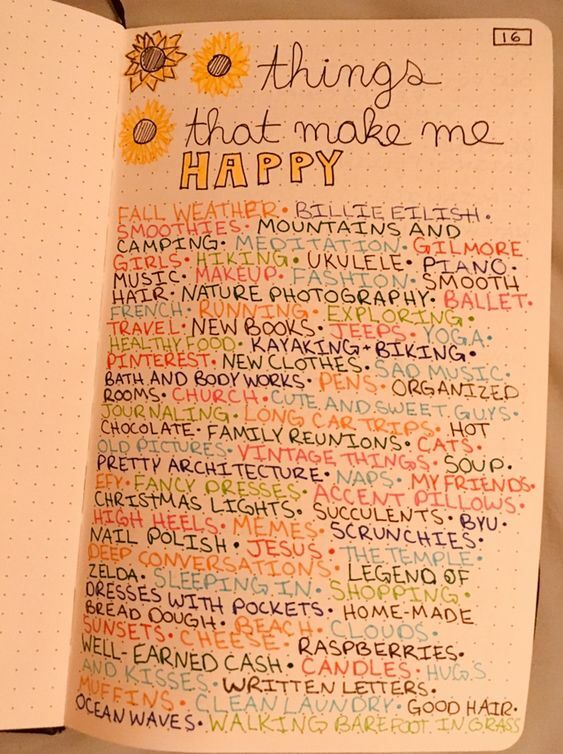 For more gratitude logs, Pinterest never fails! I love reading books! It’s one of my favorite pastimes. How about you? 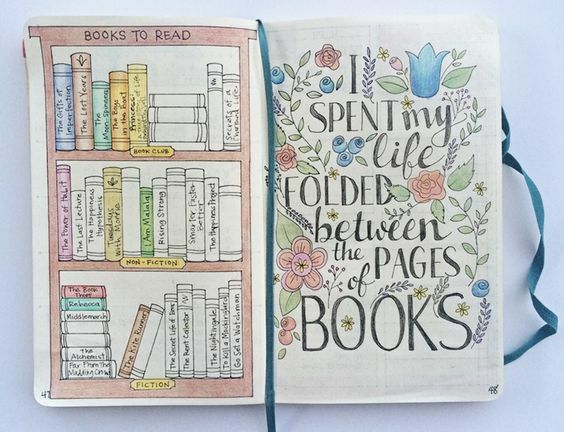 Do you love books too? 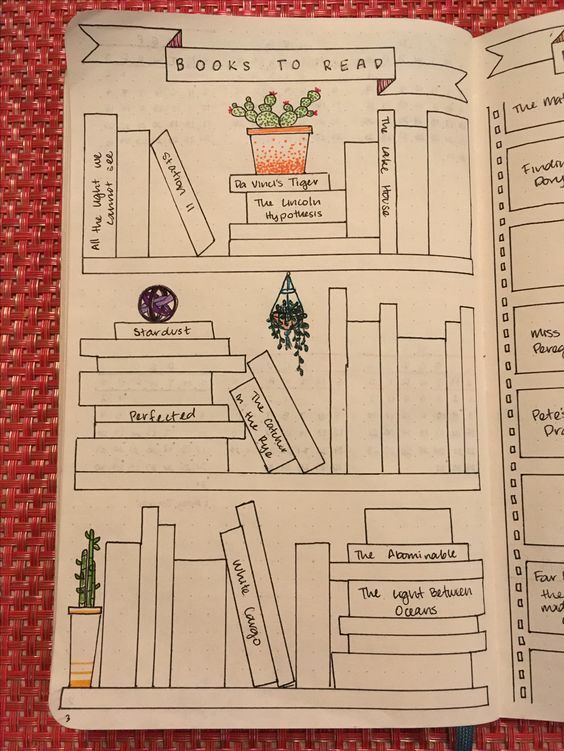 How about keeping a list of your favorite books in your bullet journal? Sounds fun, right? 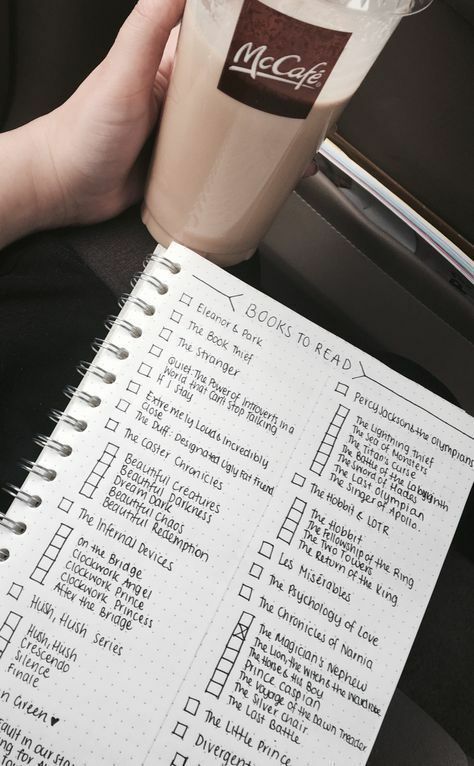 Keep track of the books you’ve read already and the ones that you still want to read. 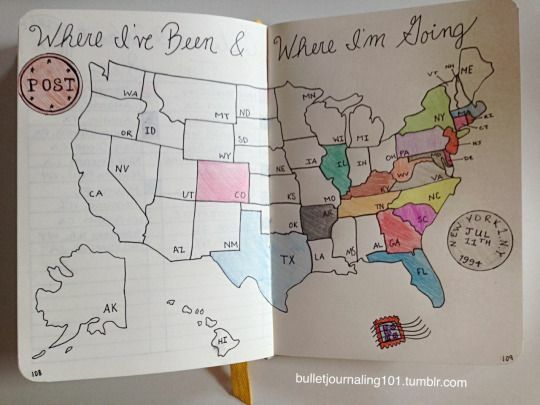 If there’s a book you left unfinished, you can track of that here too, by partially shading its drawing or box. Now if you bought a lot of books, it will be easier to determine which ones you have already read. When you’re ready, you can donate that to give space for new ones. 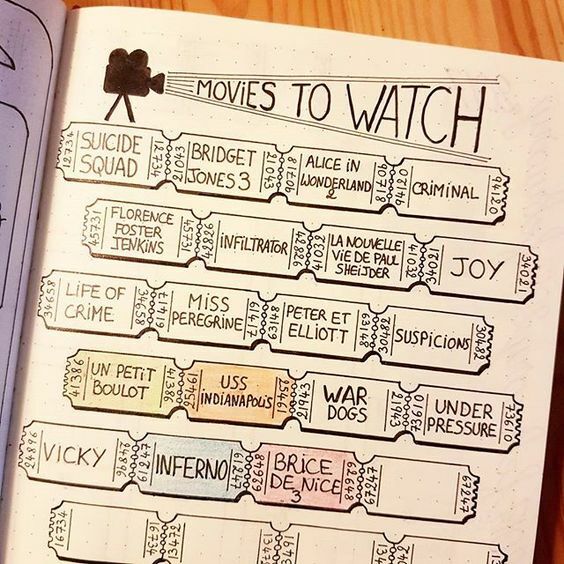 Just like books, you can reserve a BuJo page for all the movies you want to watch. Whether it’s romance, comedy, drama, religious, suspense, magical, animated films, there are certain films that are really must-sees. Now I’m not saying be a couch potato and use all your free time glued to the screen. When it comes to watching TV, it can be a bonding activity with your family or with your friends. 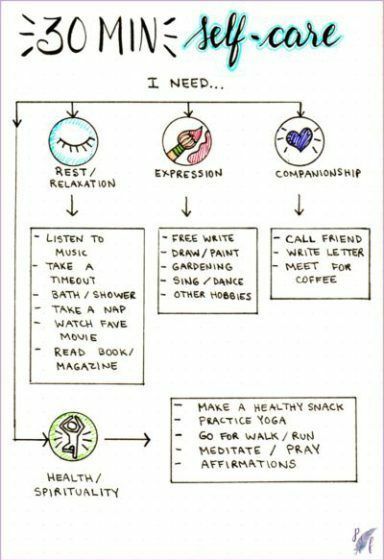 Or it can be just a simple moment to reward yourself – an enjoyable alone time to relax and get your mind off from a stressful week at work. 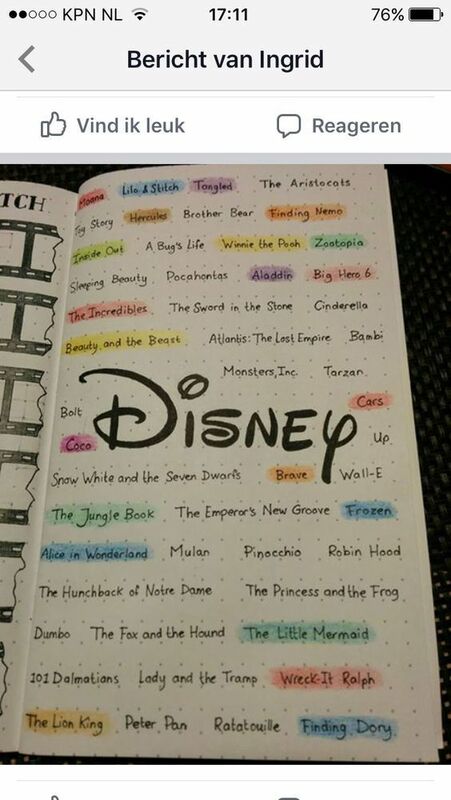 So write all the movies you want to watch. 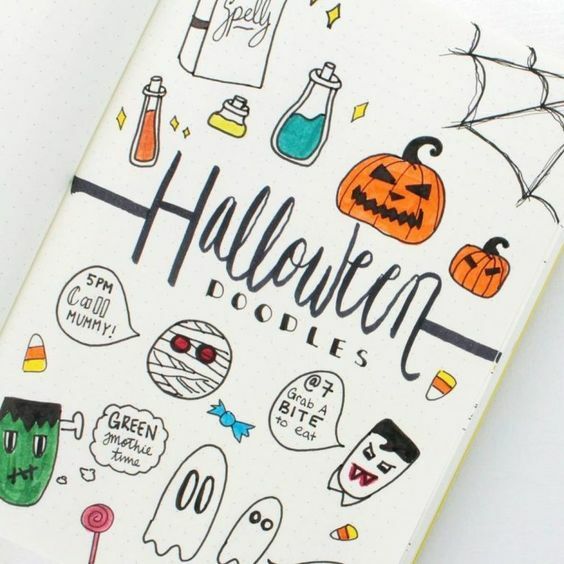 Color them (or their boxes) when you’re done. Certain movies give lessons. 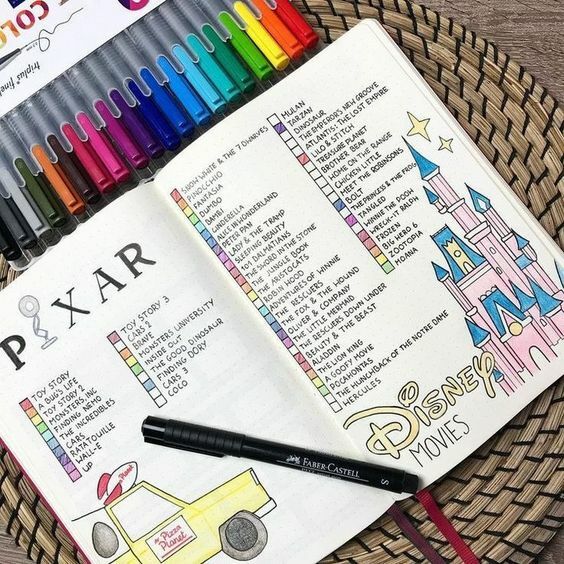 If that’s your type, you might as well add another page to write what you learn every time you watch an inspiring movie. 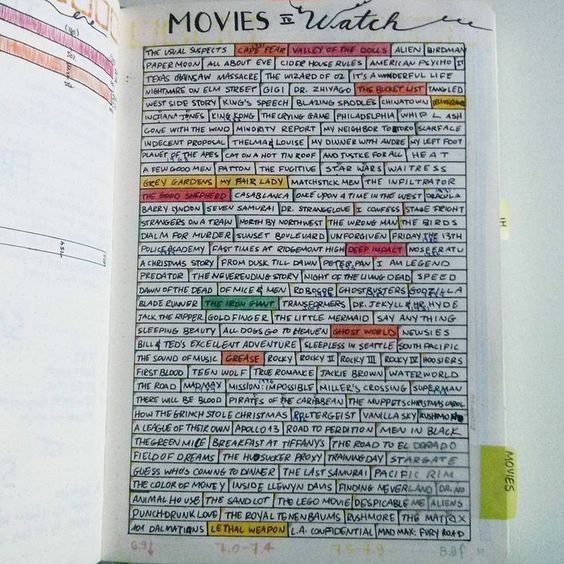 Here are more layouts of Movies to Watch page from Pinterest boards. You have a page for books, movies, and now… songs! 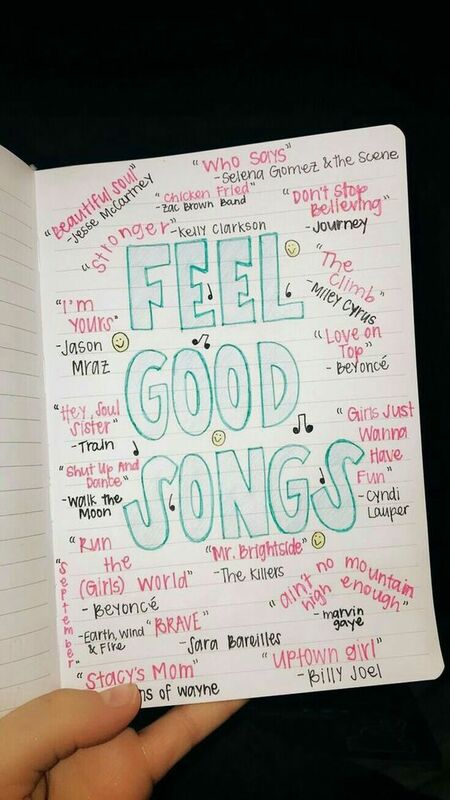 It can be a collection of songs from your favorite singers. 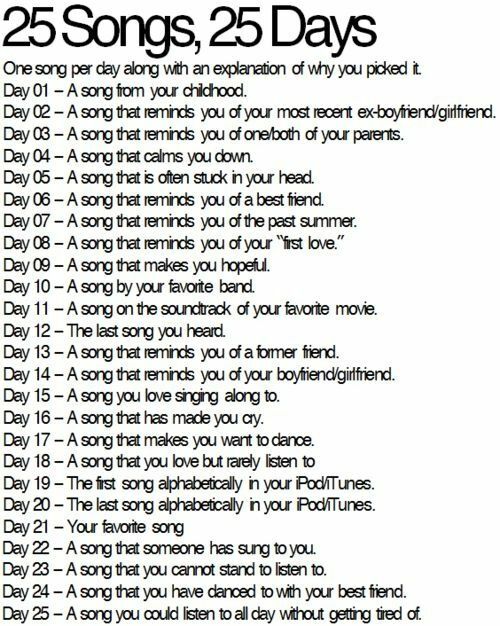 Or a list of songs that inspire you when you feel a certain way like when you’re down, hurt, angry, lonely, happy, in love, etc. 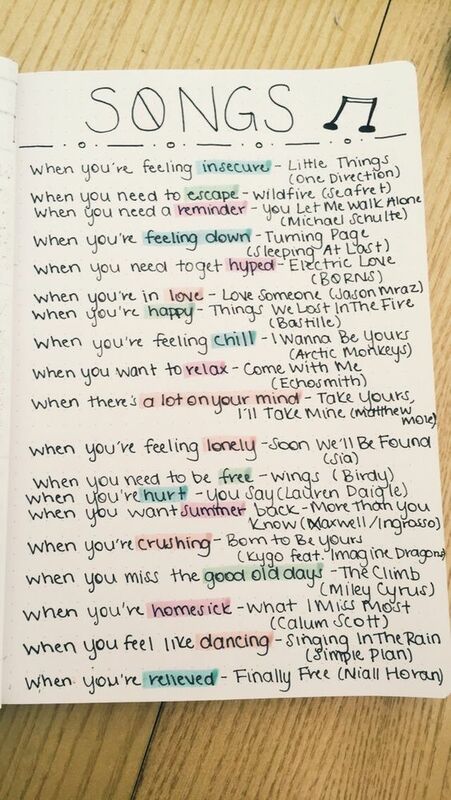 Whenever you hear an uplifting music, add its title on this list. Then download it later in your computer or your smartphone. And what remains is you hitting the play button! 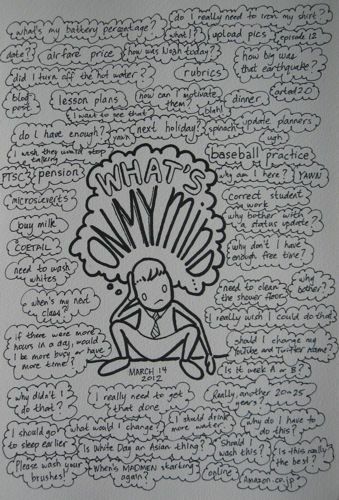 What are the things that you want to have in the future? Collate them all in your wish list with price included. Just don’t forget to be grateful when you already have it. Now, as much as you want to receive, be eager also to give. After all, isn’t it more blessed to give than to receive? 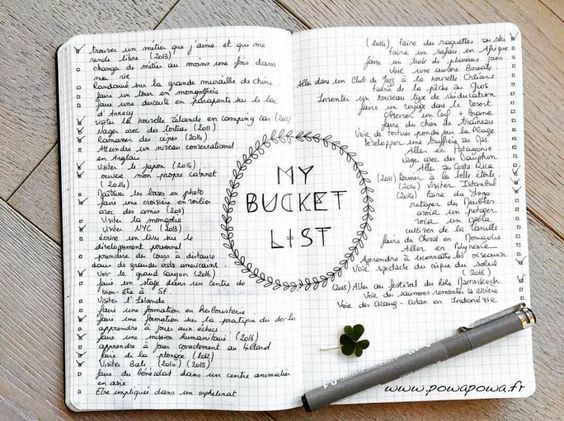 Bucket list — the ultimate list of all the things you want to be, to have, and to do, before you leave this earthly life. You can’t pursue everything in a lifetime. Even if you live for a hundred years, there will always be one more thing left to be, have or do. So be intentional. 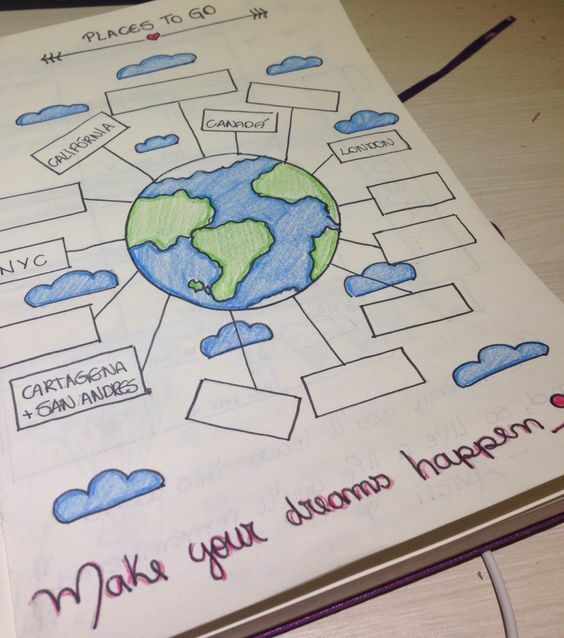 If you want to fulfill your dreams, the first step is defining those dreams. 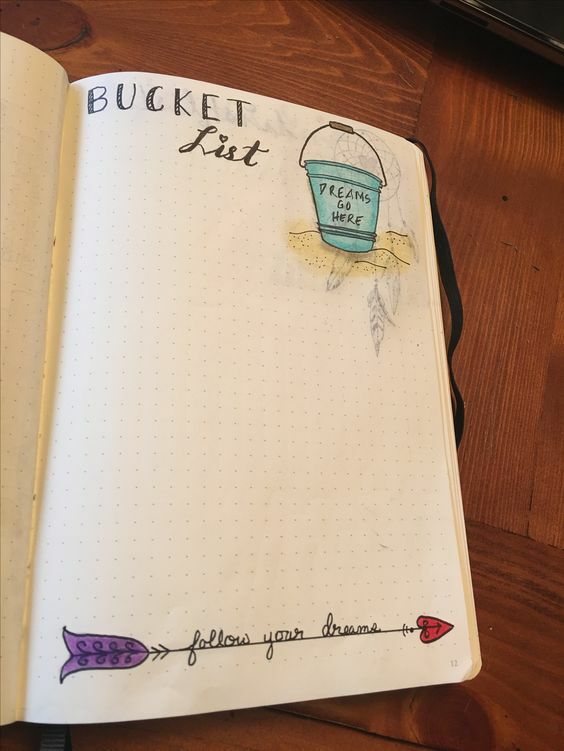 Your bucket list is a list of your dreams, big or small. 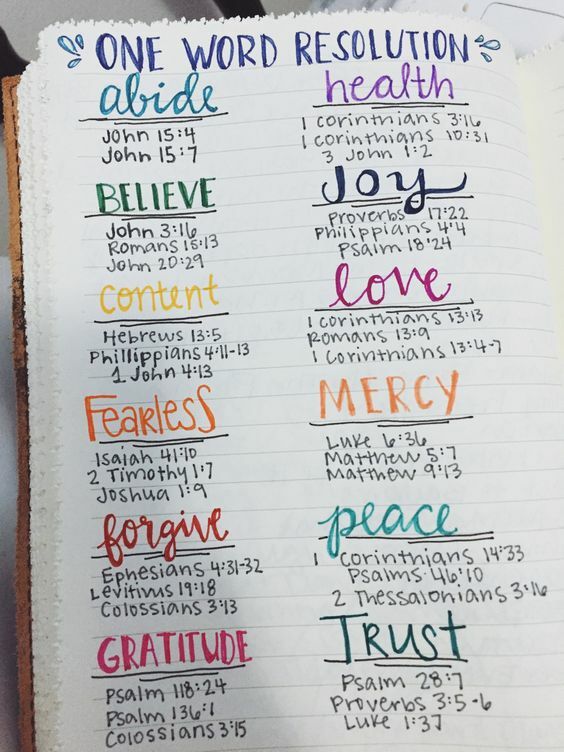 Having a list like this gives you direction and inspiration. With this on your mind, you have a glimpse of how you want your future to look like. 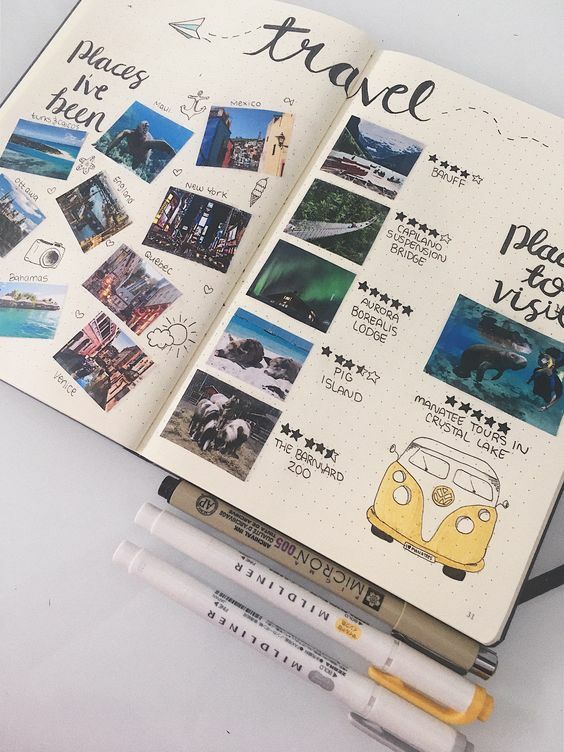 For example, if your bucket list looks like a travel list, then you must love traveling. Your choices in life particularly your career or lifestyle should give you the time and the ability to go to these places. 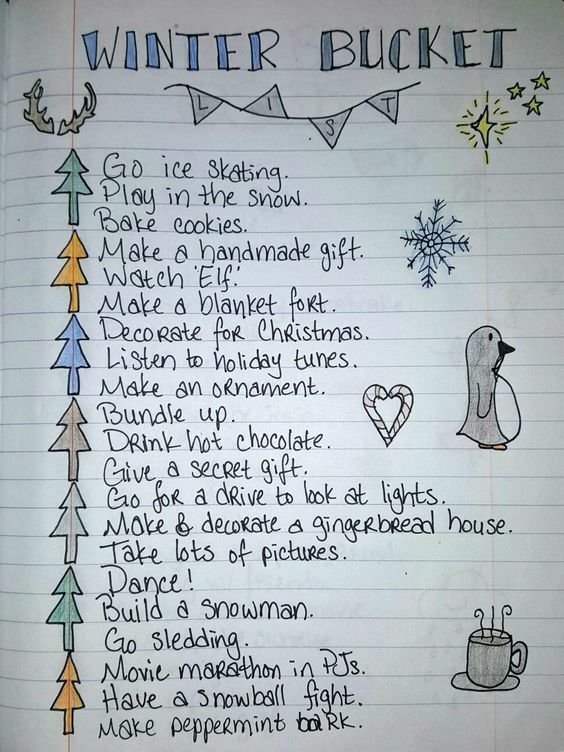 Even more so, following this list, makes living more exciting! 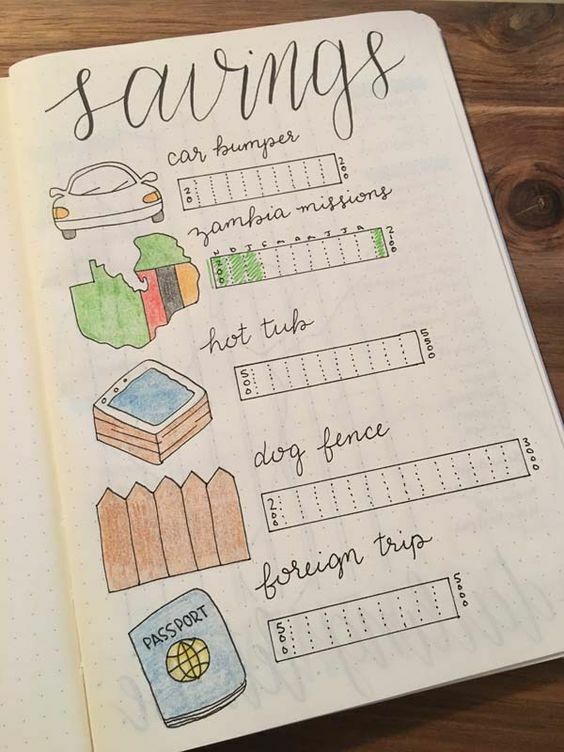 Yes… another bucket list! But this time it’s specific for each season. 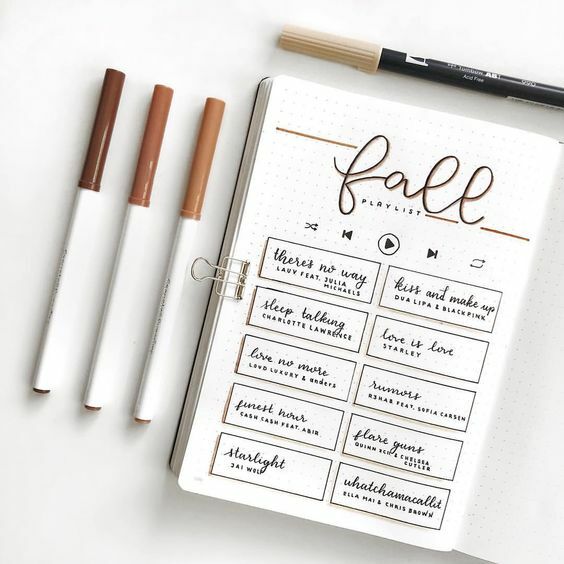 Making this kind of bucket list will help you be more intentional with each season, taking into consideration the uniqueness of each time, and seizing the opportunity to do things that fit well specifically on winter, spring, summer and fall. 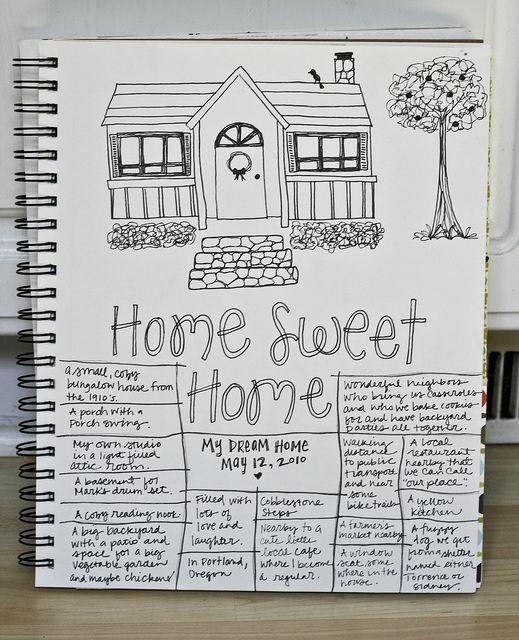 Does your dream home inspire you? 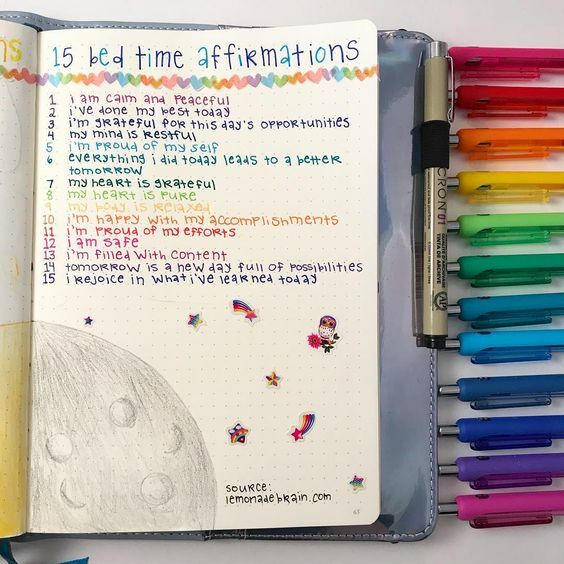 If it makes you feel good, or makes you strive to become better in your job or business, or motivates you to organize and clean your home, then this deserves a place in your bullet journal. 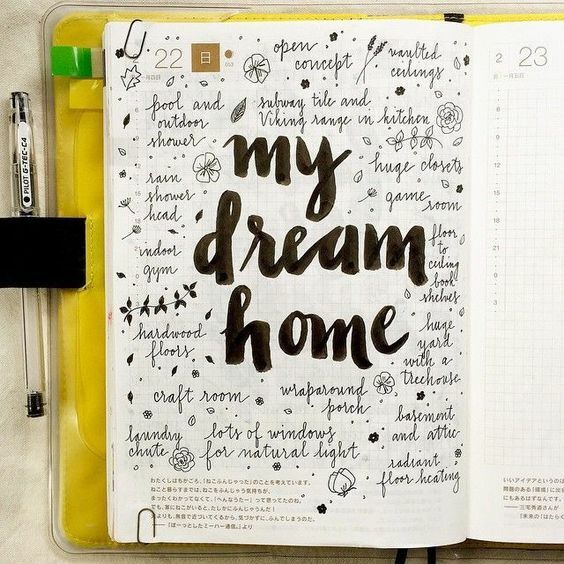 Just write down everything you want your home to be – how does it look like, what are the things you can find in there, the aura when you come in, everything you want it to be. 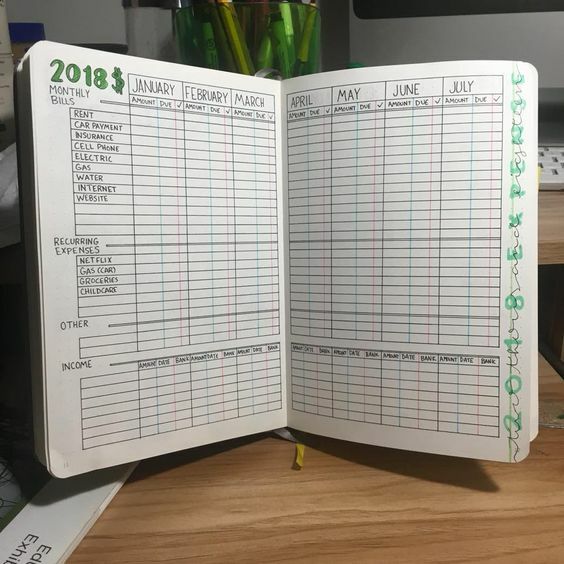 You can even cut or print pictures and paste them in your BuJo. 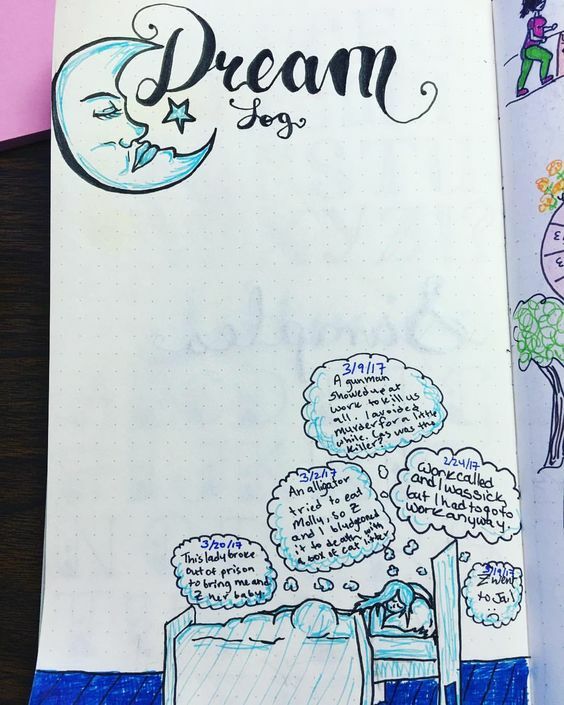 I used to record my dreams in a notebook. Okay… just the nice dreams. Those dreams where I had super powers and I could fly and do magic! I wanted to remember those nice dreams but I soon realized I didn’t need superpowers to make my life exciting and feel more alive. So I don’t record those dreams anymore. But you may want to record yours. 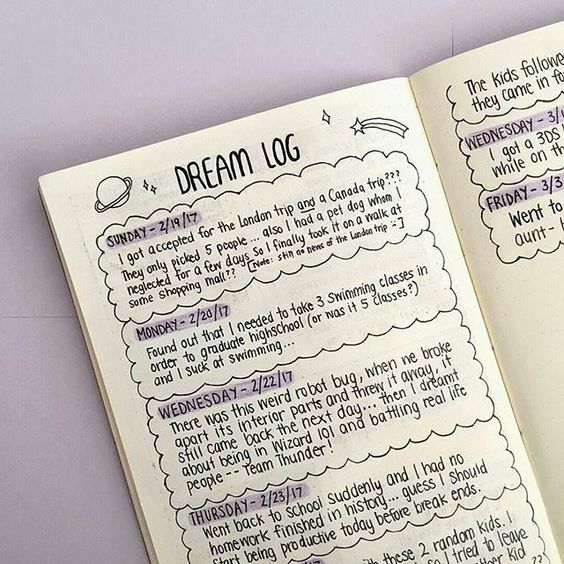 Either for entertainment purposes, or for the more serious reasons to write down your dreams, your bullet journal is a notebook just perfect for that! Our minds are often preoccupied with things in the past and things that we have to do or can happen in the future. While there’s nothing wrong in reminiscing the past or planning for the future, these should not deter you from living in the moment (or being physically and mentally present in whatever you’re doing right now). 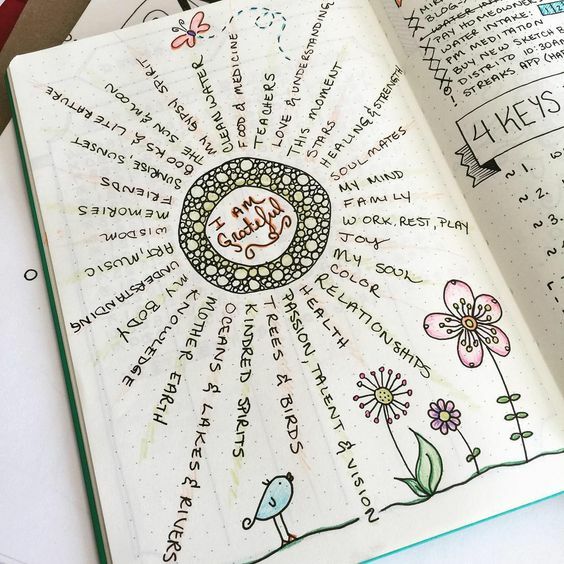 One of the ways to put you in that ‘living in the moment’ mode is a Currently page in your bullet journal. 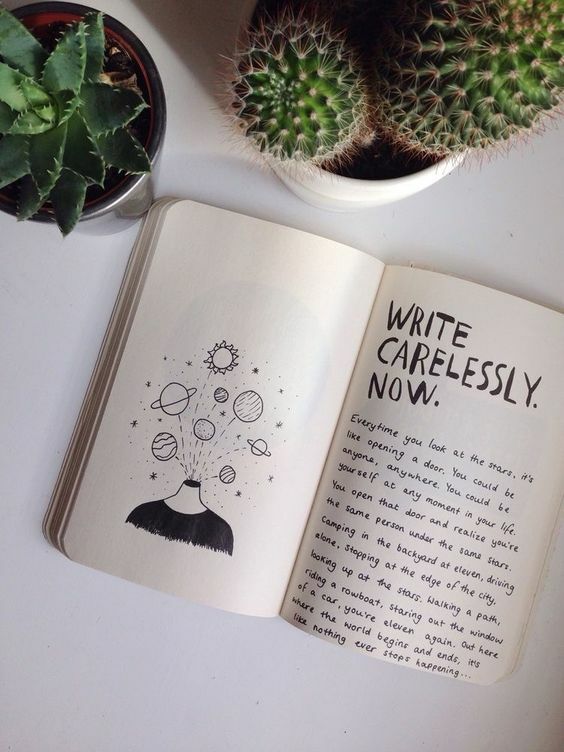 You can write there whatever you are doing to help you focus on that, what you currently feel, what you’re eating or drinking, and any other small detail that you want to notice and be aware of in your present surroundings. Know thyself. My father always reminded me of this during our father-daughter talks. Do not try to become a copy of someone else because you are unique and it’s a good thing to be different. We are all different from each other in our own ways. Yes you have similarities with others but one way or another you’re going to be different too. We don’t have problem with the similarities. We get along because of that. But we don’t like it anymore when we see how different we are from the crowd. We feel like we don’t belong. If you don’t belong, then you must be in the wrong tribe. But how will you if you do not have a clear sense of who you are? 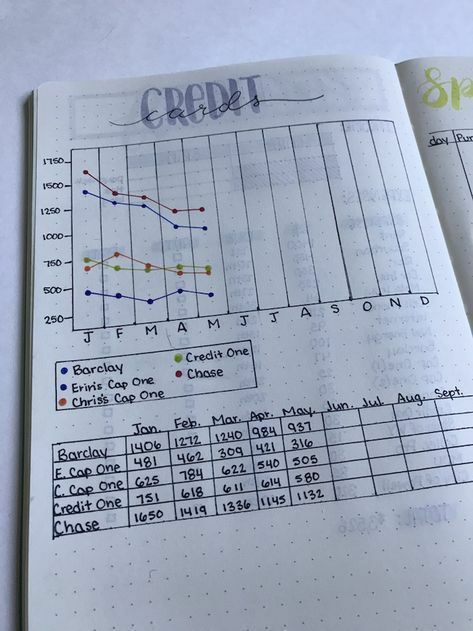 In you bullet journal, add a page which answers exactly just that. What do you know about you? Who are you? What do you like? What do you believe in? What are your qualities and interests? What are the things that you will not put up with? 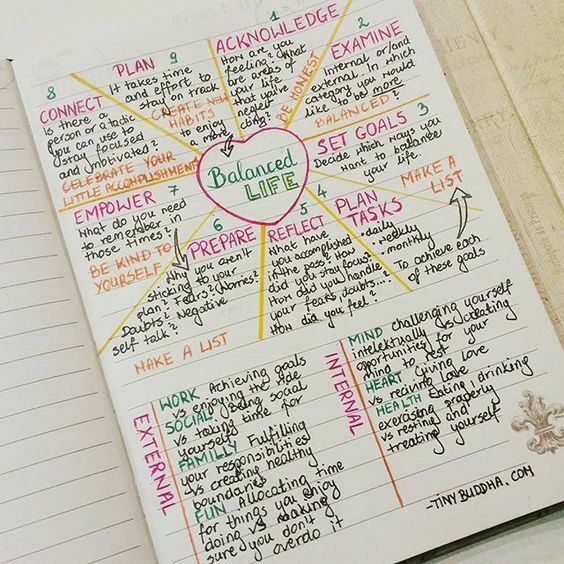 As you go on with your life and discover more about you – interests, hobbies, dreams, qualities, life principles, write them down in your bullet journal. The more you know yourself, the more will it motivate you to grow into the best version of yourself. 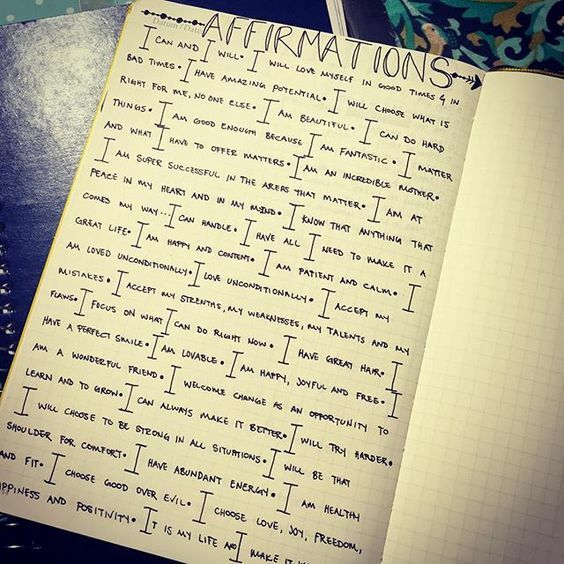 Another way to stay positive is to affirm yourself. 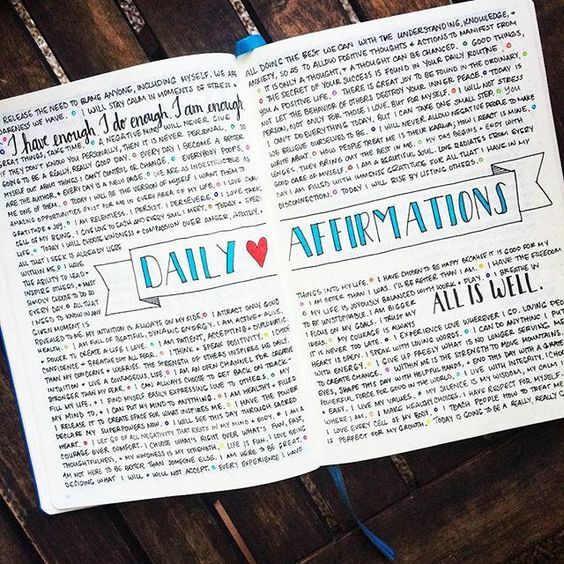 Affirmations, when read regularly, conditions your thinking and helps you develop a more positive perception of yourself and the things that you can do. But nobody’s perfect. We all make mistakes. Too often, we look so much on what we don’t like about ourselves that we don’t see the good anymore. When you make a mistake, pick yourself up again, and start doing things differently. But let that remain as a learning lesson to you. There’s no need to keep reliving your mistakes and telling yourself how dumb or how terrible you are. Being critical about ourselves will only hold us back in life, giving us a negative view about ourselves which shouldn’t be there in the first place. Learn to accept yourself for who you are, without worrying about proving yourself to others or even outshining them. Who are you? What are you good at? 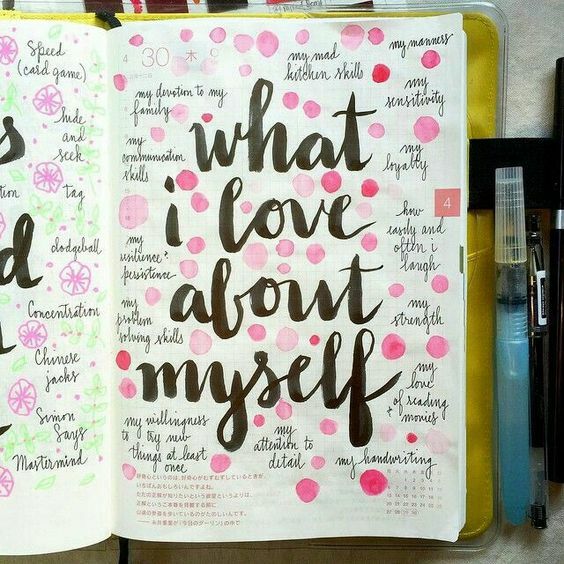 What are the qualities that you love about you? 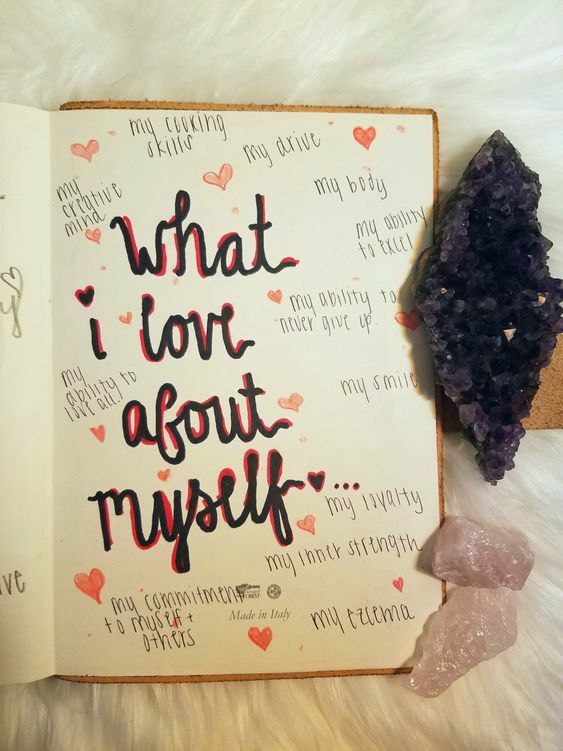 Shifting that focus from the negative things t to the good things that you love about yourself will not only make you feel good about yourself, but will make you want to grow more into those positive qualities that you already see. 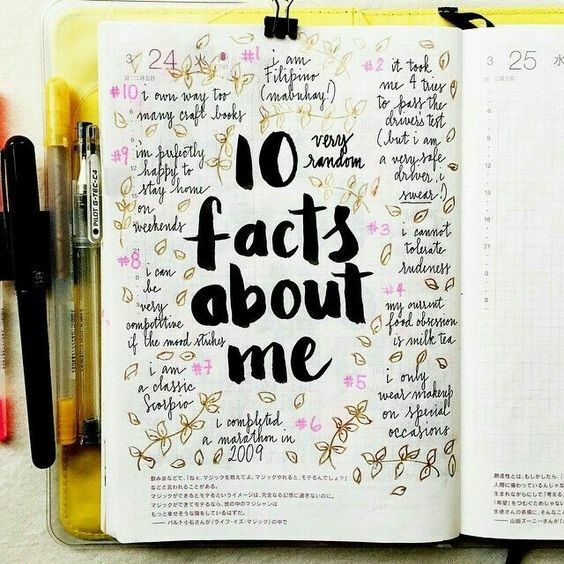 So go ahead and enumerate all the things that you love about you. 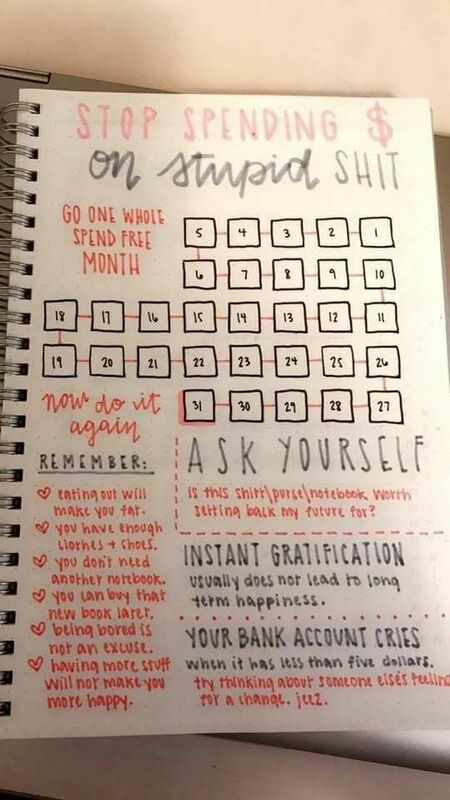 And write that down in your bullet journal. When was the last time you heard someone say something good about you? Compliments feel good, don’t they? And not only that. Compliments are also feedback, affirming us and telling us that we’re doing something good or we’re on the right track. Like for example, you want to be better at your job. If your boss compliments you for passing a report on time, that’s something. It means you can be relied on to finish things on time. All too often we are critical of ourselves, noticing our failures more than our accomplishments. 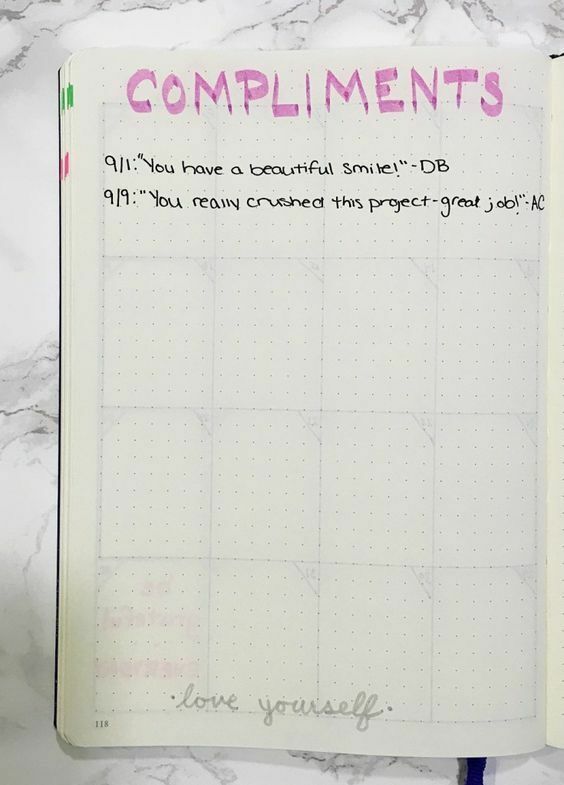 Keeping a Compliments Page in your bullet journal is one way to remind you of the good that others see in you. Focus on the good things about you and you will have more of that. 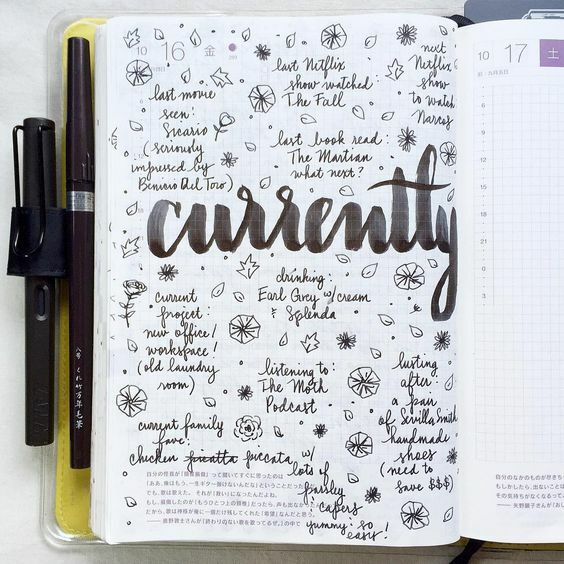 Having a page to write everything down is a great way to keep things off your mind. 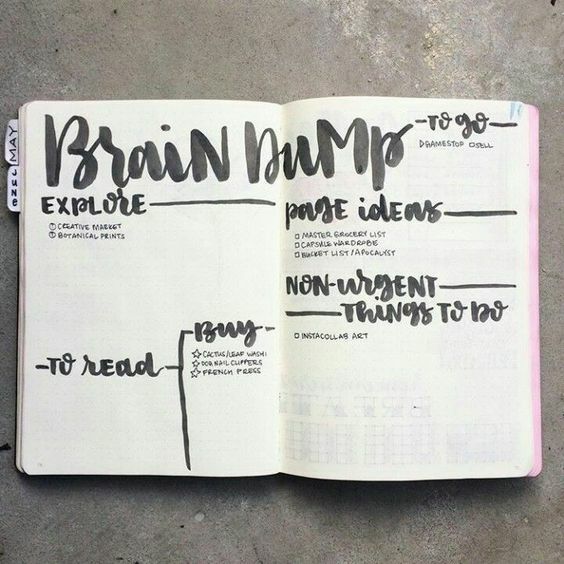 When there’s a lot of things going on in your head, it’s hard to focus, and you will find yourself easily jumping from one task to another, without really finishing anything. So why not put everything on paper? 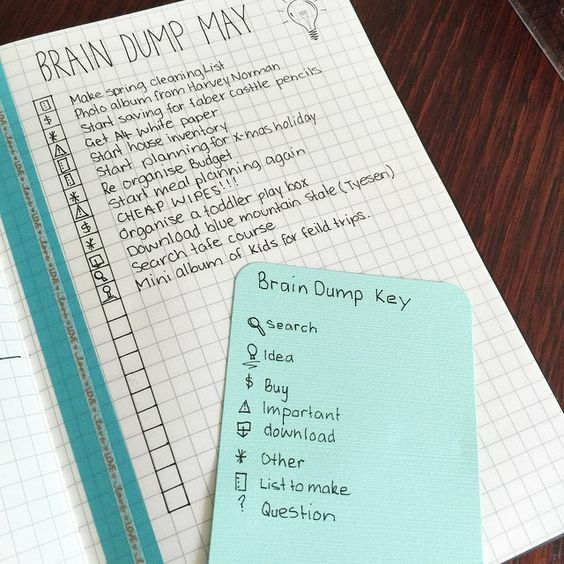 When you notice that your head is particularly busy, and there’s too much on your mind that you do not know anymore which should come first, it’s time for a brain dump. 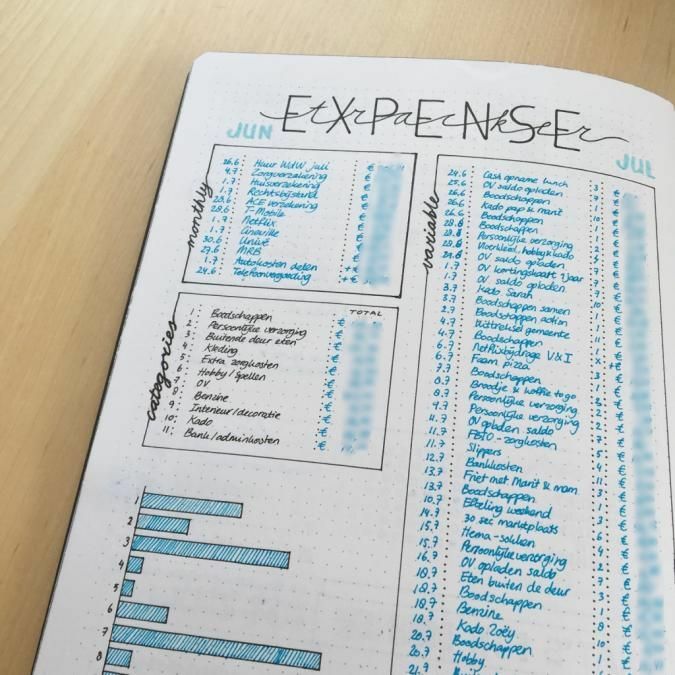 Dump everything in one of your bullet journal pages. Write everything that comes into your mind until there’s nothing left. After that, look at the things you’ve written. You’ll find that you now have a clearer sight of the things that you were constantly thinking about. 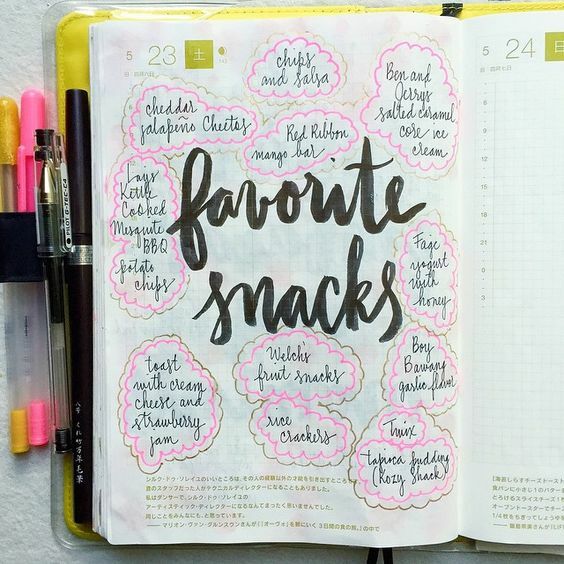 Then you can start focusing on each item, one by one. You’ll see which needs to be prioritized, and which should come last. More importantly, you’ve stopped them from popping up in your mind every now and then, because even if you have not addressed them yet, at least you have put them on paper, which tells your subconscious that these will be dealt with later. 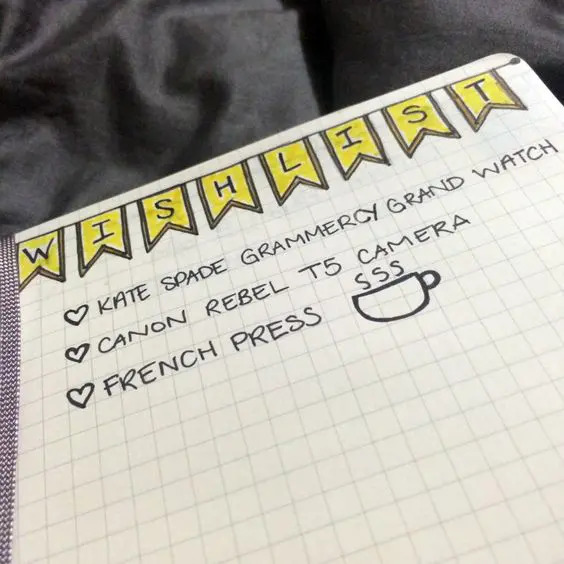 Now even if you forget about them, you’ll have a way to go back to them because they are written in your bullet journal. Unlike in some random papers, it won’t easily fly out of your table and get lost. 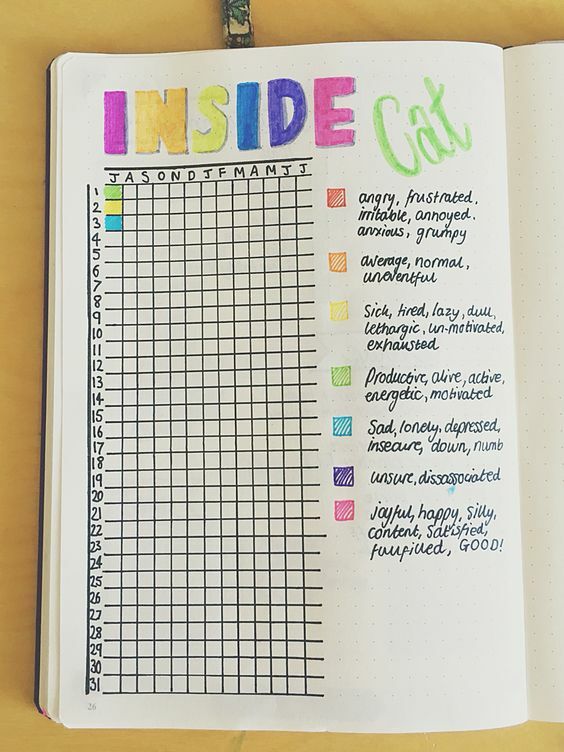 Tracking your mood is an effective method to keep your emotions in check. 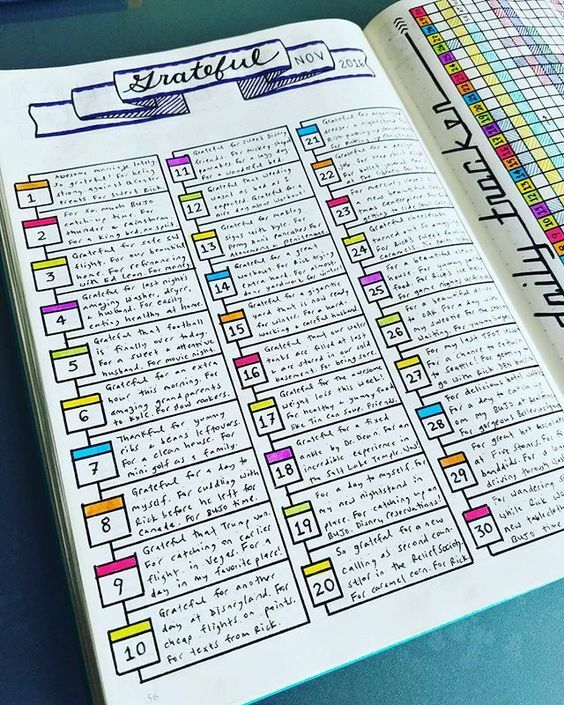 Whether you suffer from anxiety or depression, or you just often experience a roller coaster of emotions, a mood tracker page can help to improve your life. 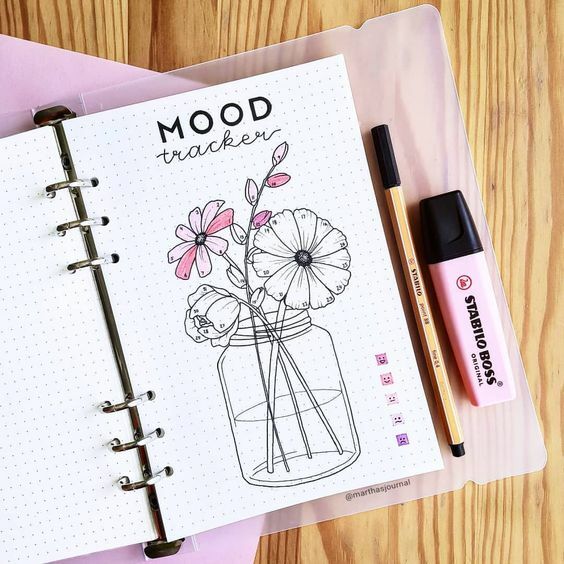 While it can be hard to describe how you feel sometimes, the good thing about a mood tracker is that it is flexible and you can customize it. If you are not sure of what you feel, you can blend moods or make up new ones to describe how you are feeling. 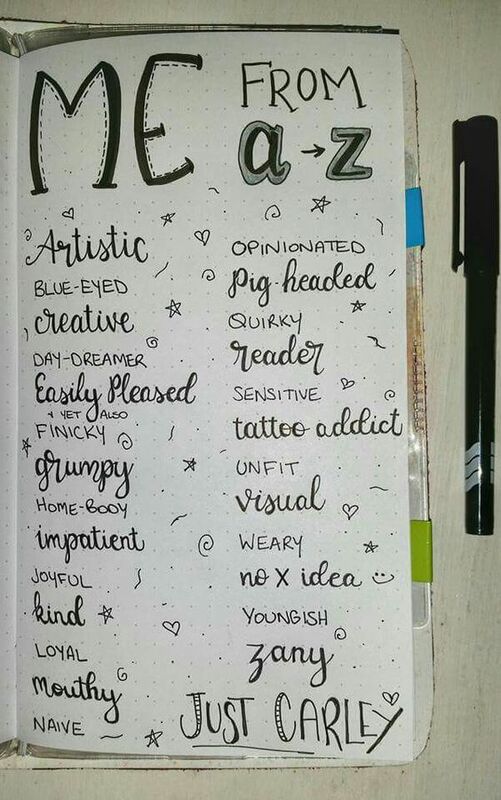 In you Bujo, you can use different colors or shapes to represent different emotions. It’s okay to think about our problems. Worrying too much can interfere with your ability to do the things you need to do everyday. And it certainly doesn’t change anything – either facts or the circumstances you’re in. 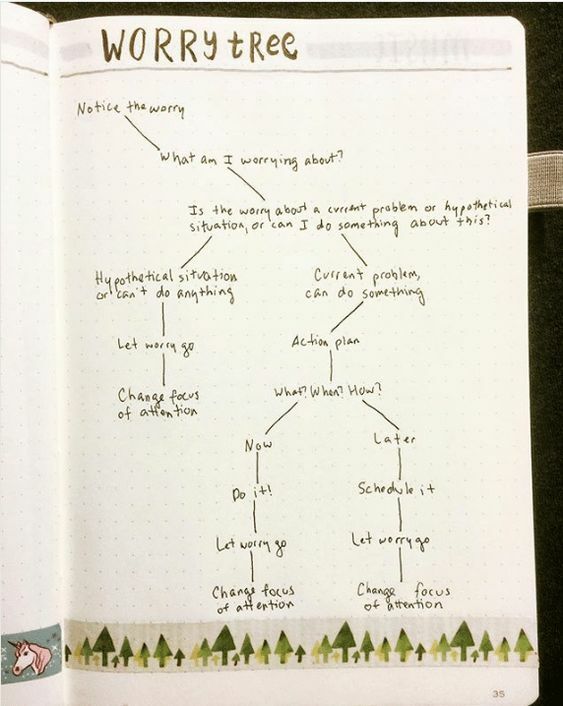 So instead of worrying, you can tackle your worries using a worry tree, evaluating them. Doing so will help you categorize and clarify what you are worried about – whether it is something you can act on, or something that you just can’t do anything about. In this way, you can tackle your problems in a relaxed way, without feeling anxious or obsessed about finding the perfect solution. Do you often worry about the things you can’t control? There are a lot of things we can’t control. The weather. The stock market. The economy. Other people. 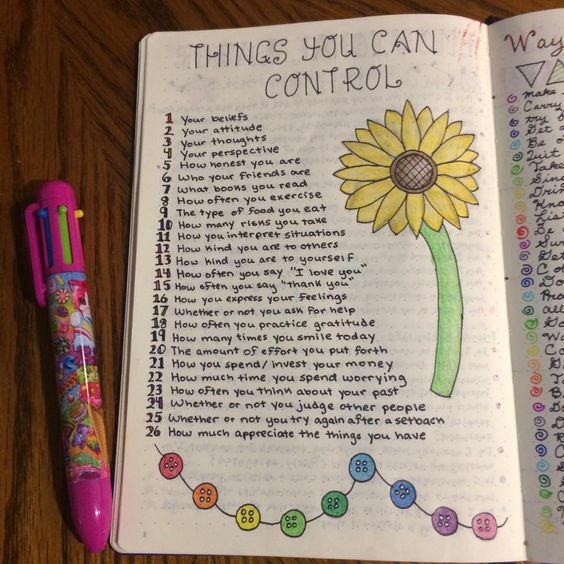 You may not have control over many things in your life. But there are others which you have full control. 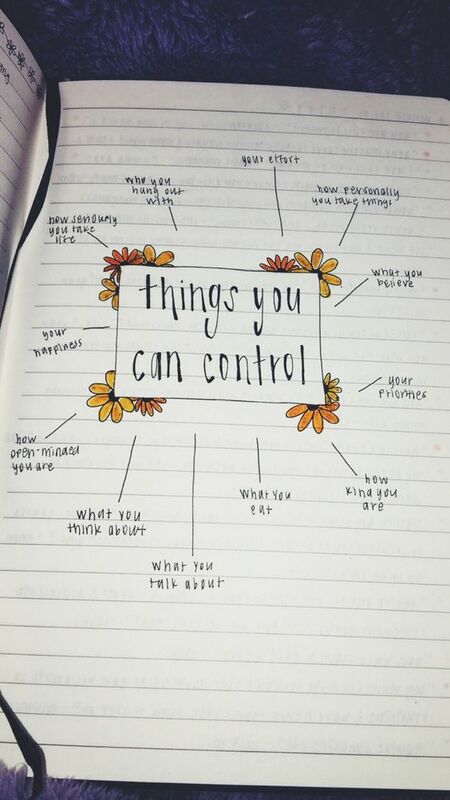 So instead of worrying and trying to manage those that you can’t control (like forcing people to change), why not just focus on the things you can control? 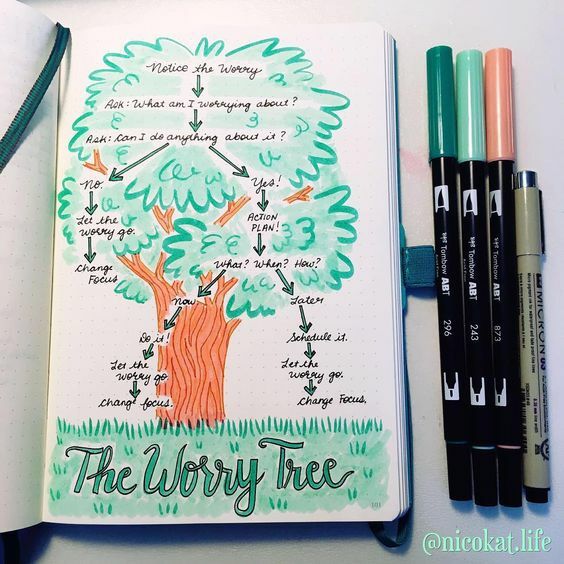 When you find yourself worrying, take a minute to evaluate your situation and determine what are the things that you can control. When you put your energy into that, you’ll be much more effective. Stumbling and falling down is not failure. Staying down is. It’s okay to feel bad when you experience something, well, bad. Perhaps you feel disappointed or discouraged because something you’re expecting did not happen. And it’s okay to feel these negative feelings. But also know that, it’s your choice how long you will feel like that. 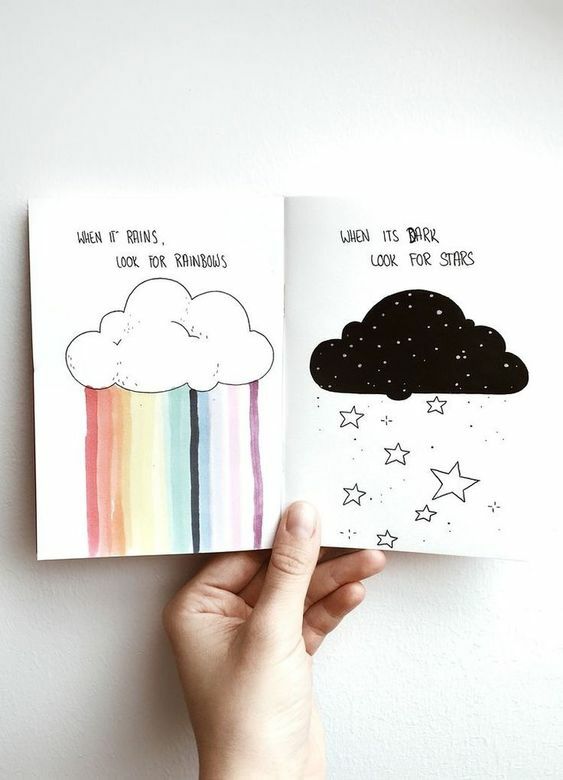 While you can choose to succumb to negativity all day, you can also choose to do something that will lighten up your mood and will make you feel better. It’s not denying your feelings. In fact, it’s acknowledging that you feel really bad, but not letting it get the best of you. It’s telling yourself, okay… this feel awful… but… I’m going to rise from this. 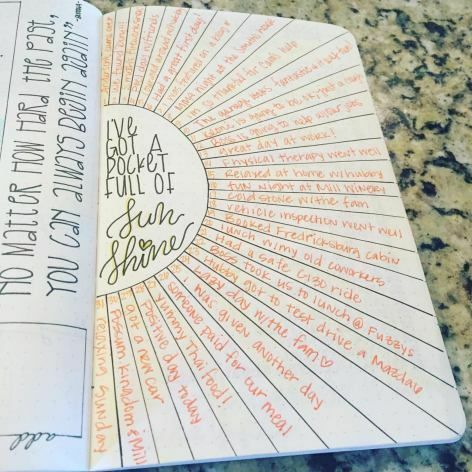 How you do that can be collected in your bullet journal. 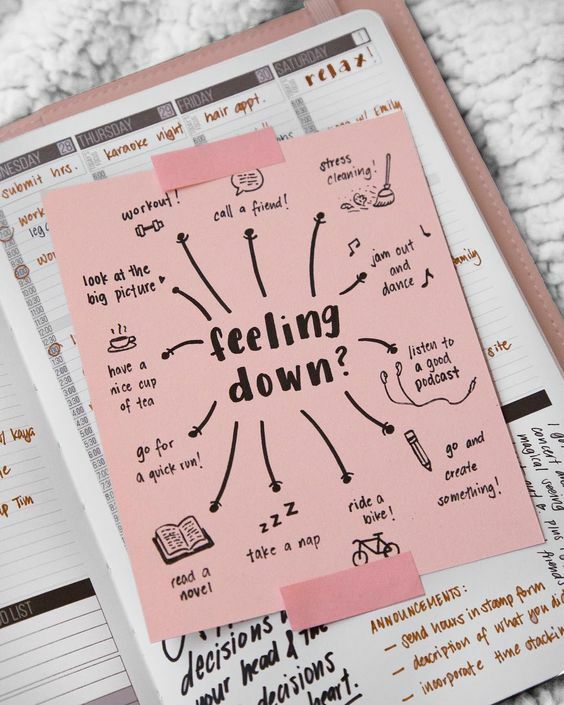 Keep a page to enumerate all the things that you do to feel better when you are down. 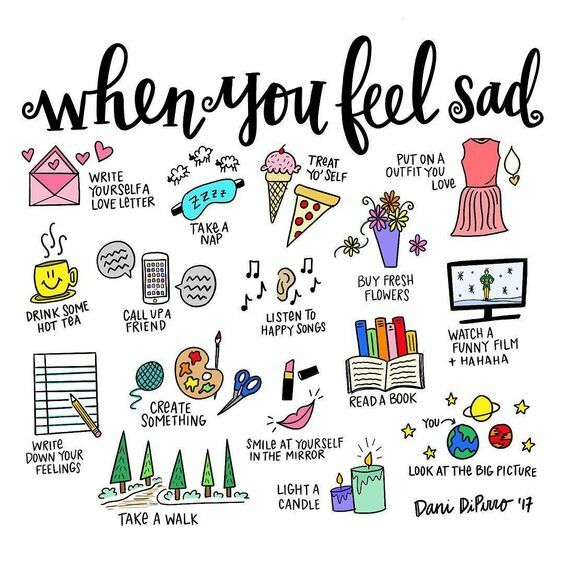 And choose to do them when you feel like you’re having a bad day. 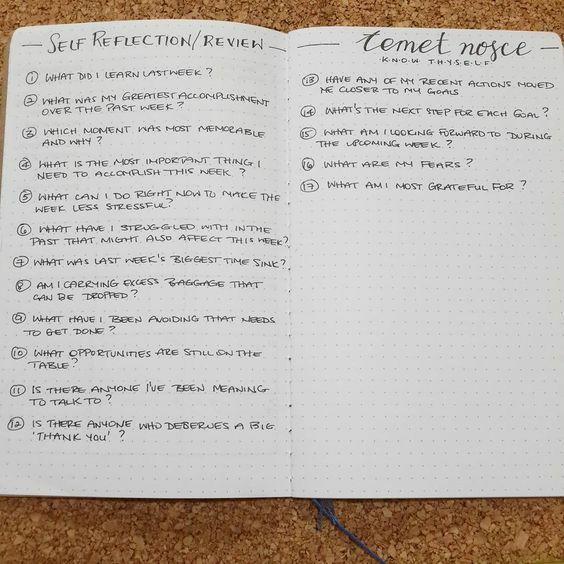 We have already discussed how important reflection is to self-growth. 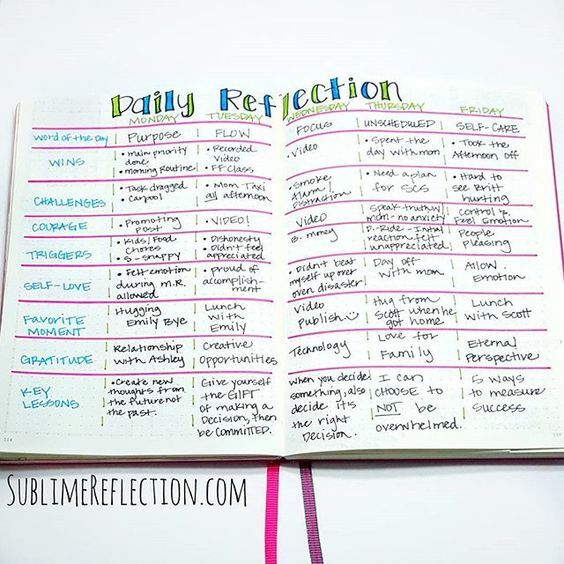 Now let’s have another page for those reflection questions! 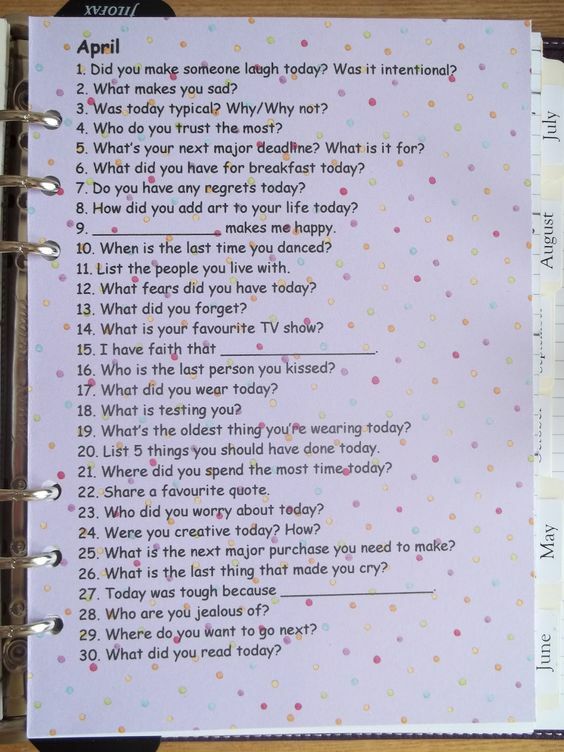 Reflection questions are your guide questions to help you get most out of your reflection time. 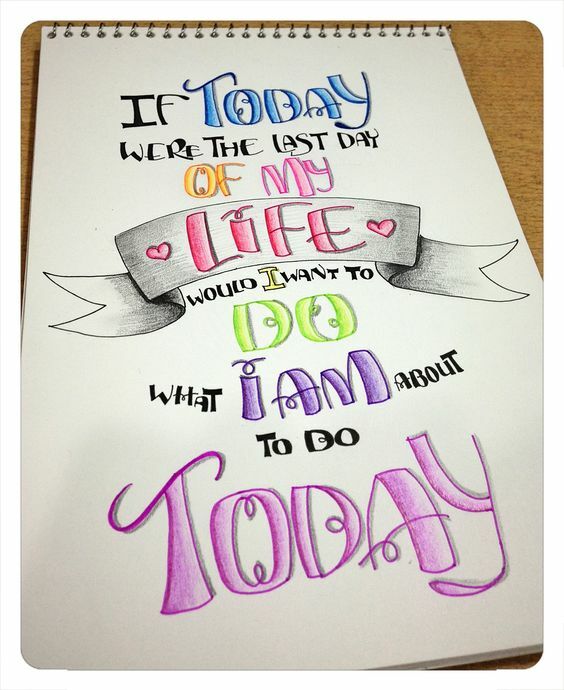 You won’t be wondering, what will I write about today, or what should I be focusing on right now. 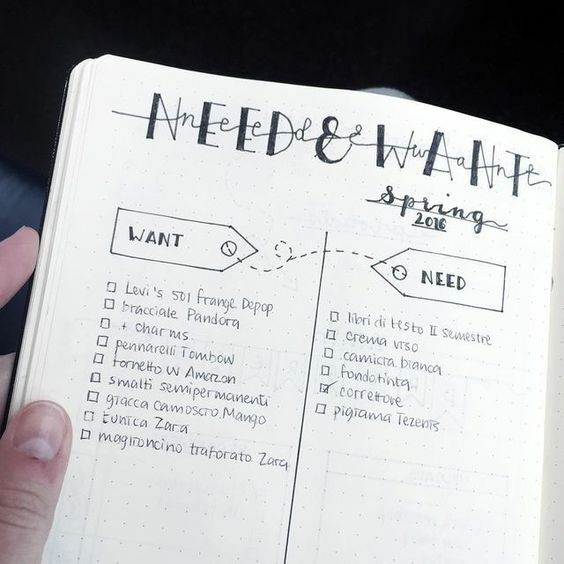 Make them available to you all the time by putting them inside your bullet journal. It can be a series of questions that you go through every reflection time. 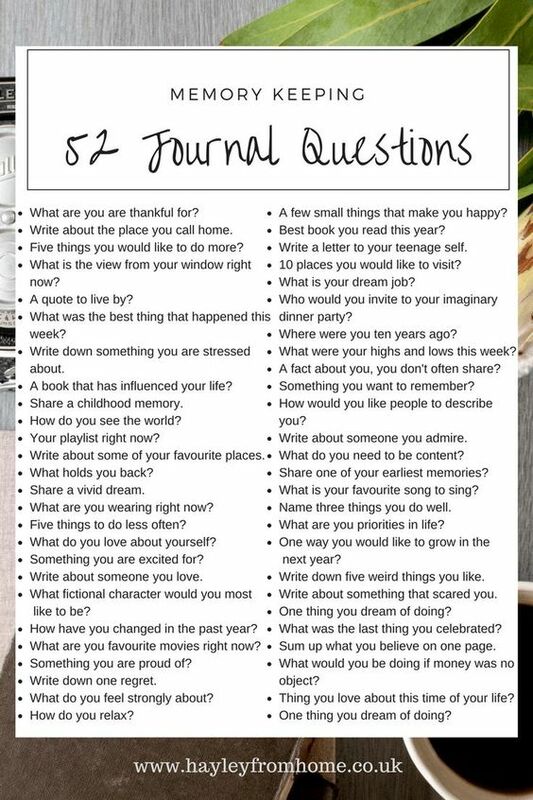 Or it can be a collection of questions where you just pick one and reflect on that. Or it can be just one major question that serves as your anchor in all your actions. Whichever you think is the best to help you, stick to that. Personal growth is a daily process. A key part of that growth is reflection. 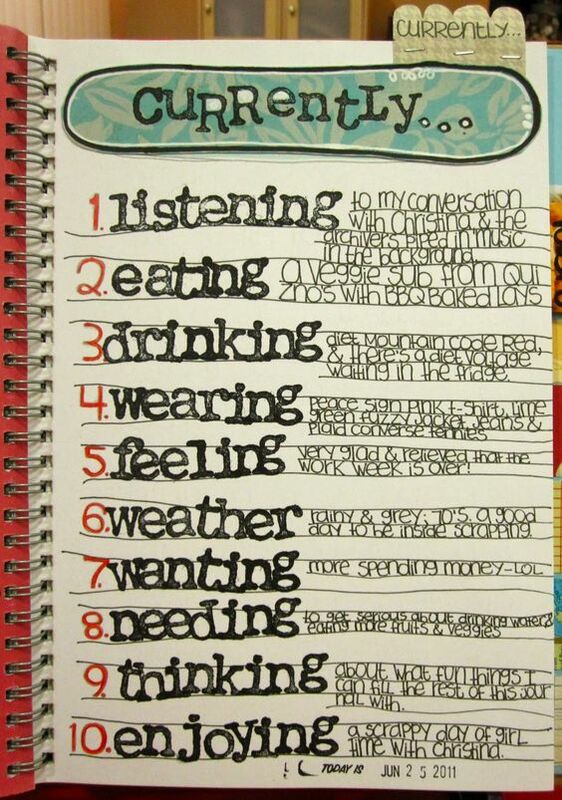 Even just a little reflection at the end of the day, probably 15-20 minutes, can be a powerful learning activity. It’s also your chance to review your performance during the day and identify the areas where you can improve. If something negative happened, this is a great opportunity to help you think things through and look at them at a different perspective. 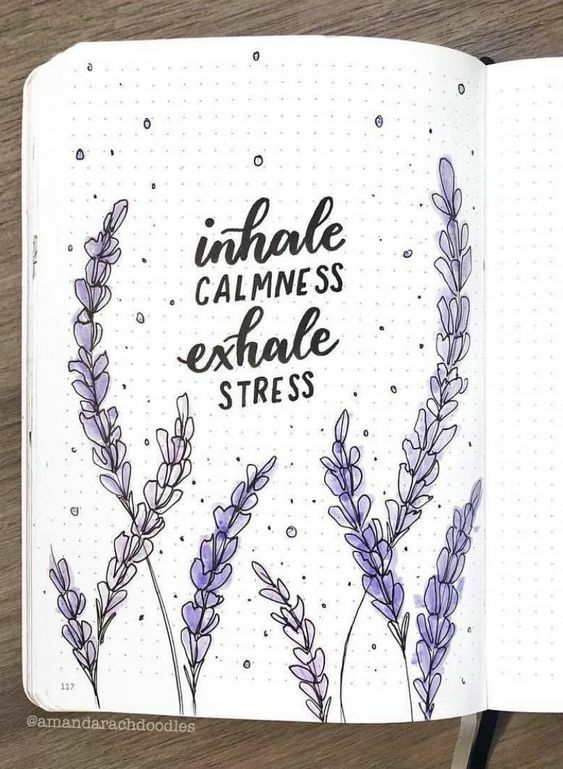 So if you’re taking personal growth seriously, don’t forget to add this in your bullet journal pages. 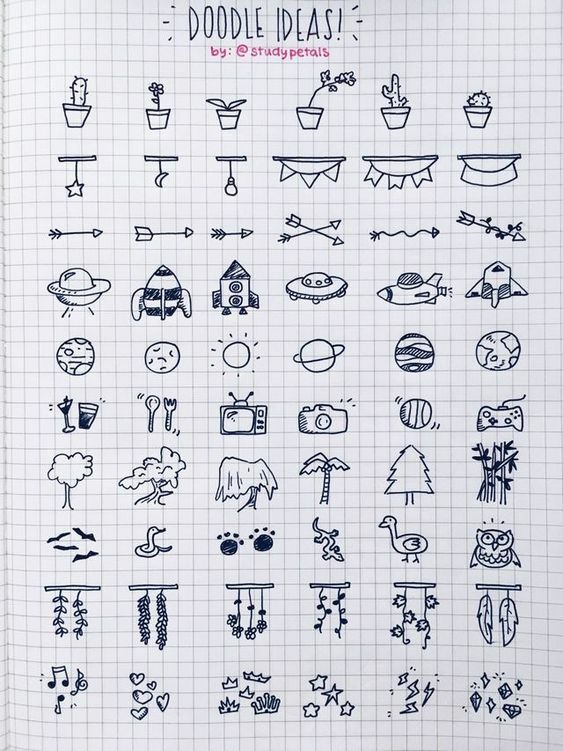 I thought before that doodles are for kids only. Turns out they work pretty well for adults too! Doodles are often done out of boredom. But do you know that it can be much more than that? 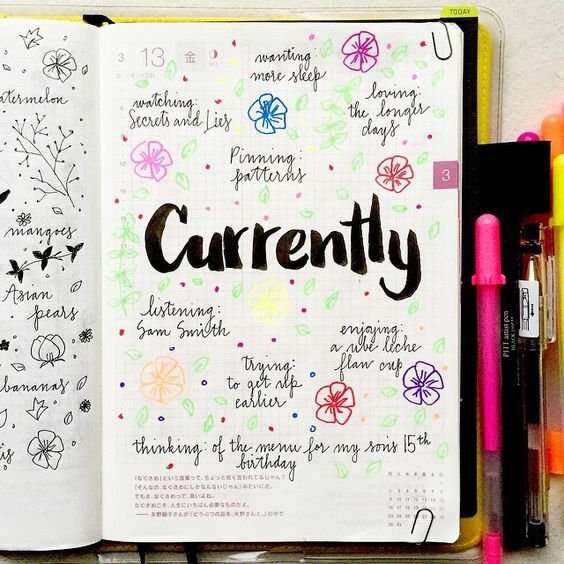 Adding a doodles page in your bullet journal is not only for boredom sake but for letting your creativity come out. 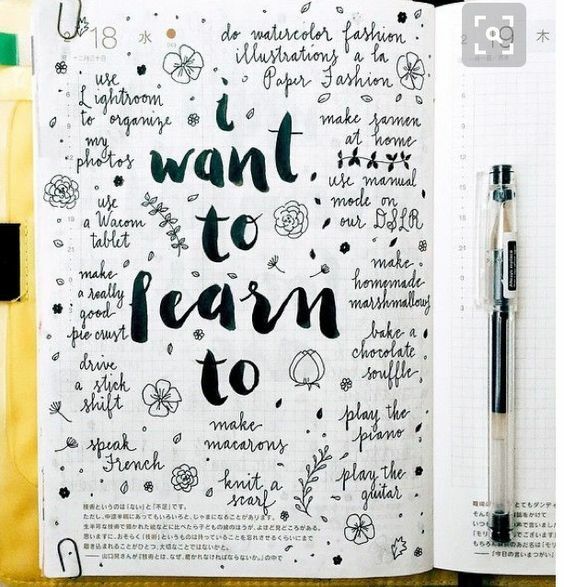 You can practise drawing and lettering by doodling. It doesn’t have to be super beautiful like the work of an artist. You can be your own artist in your own little way. 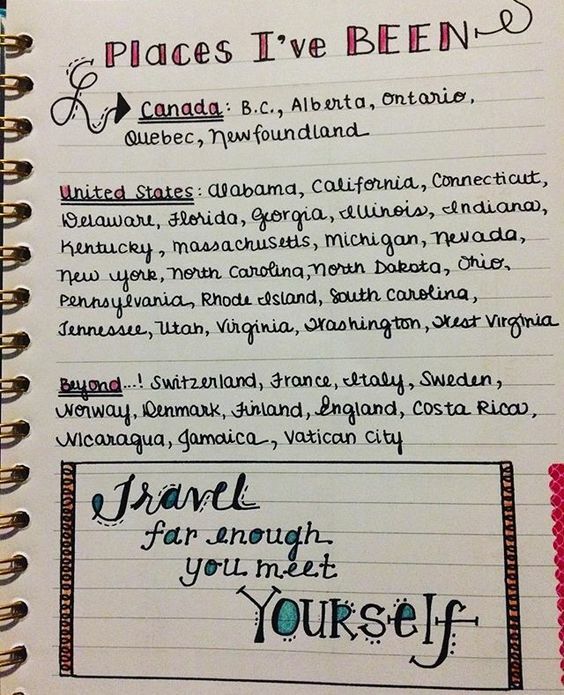 Do you love travelling to different cities and countries? 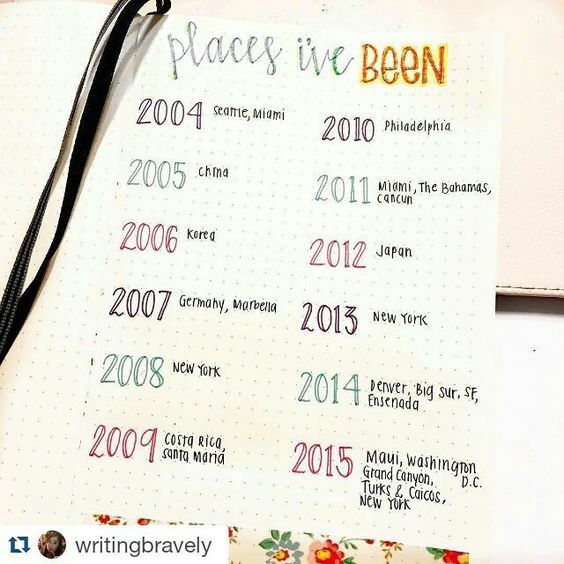 Isn’t it nice to have a page of all the places you’ve traveled to? 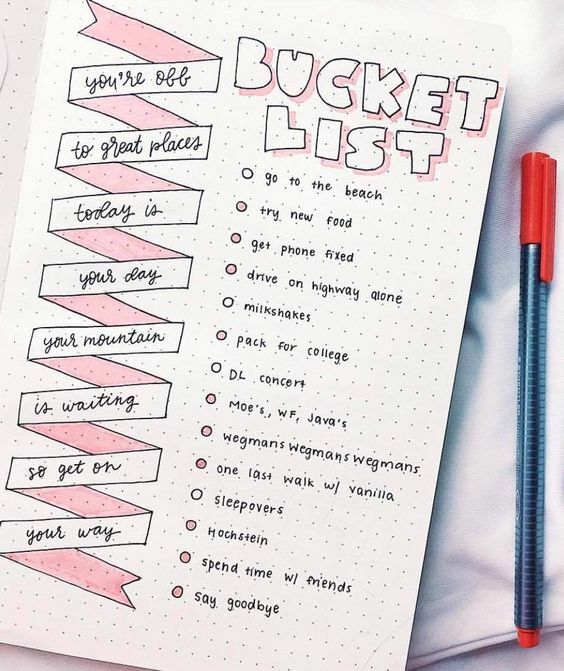 A list will not only let help you keep track of the places you visit, but you can also use it to have a better idea of where your next destination is. It’s also easier to show to your family members or friends what parts of the world you’ve seen. If you can show them the places and provide them with great feedback about your travel, that can encourage them to visit that place too. And they might even enlist you as their guide which I’m hope, you’d be happy to do for them. 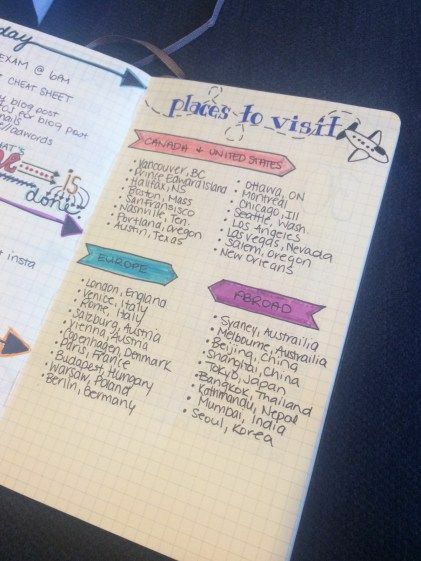 If you have a list of the places you’ve been, surely you must have Places to Go page! 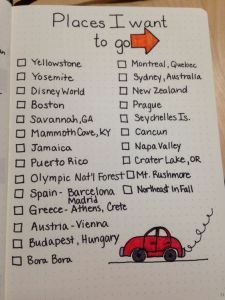 List down here all the places you want to visit – cities, local restaurants, museums, historical sites, natural sites, beaches, countries, etc. Then plan your travel accordingly, so that you don’t miss a site in a city or country. I know it’s difficult to visit every place and site when traveling. 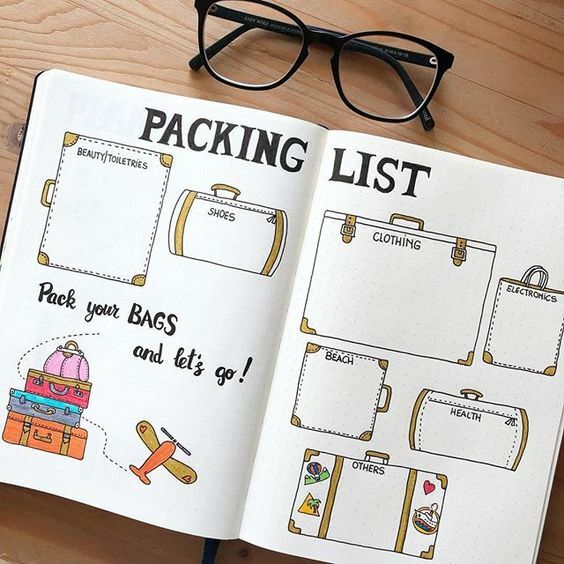 But having a list gives you direction and helps in planning your itinerary. You may not be able to visit everything, but if you love the place, you can always go back to it, then go to the sites you failed to see during your previous stay. 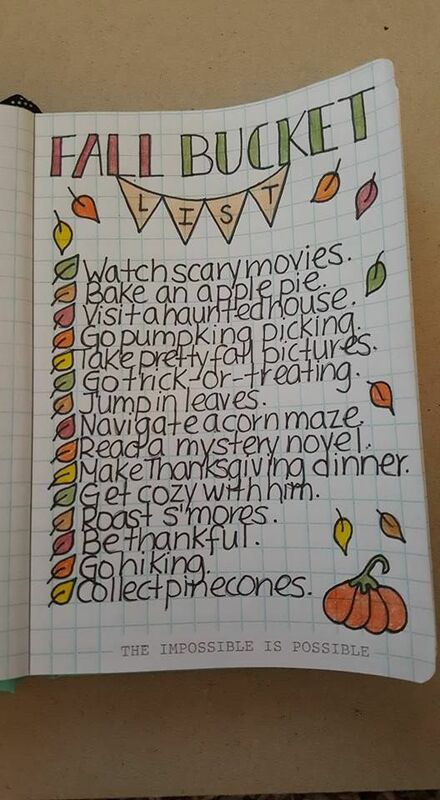 You can always combine the two lists to save space, or… maybe… this is just how you prefer things to be. After all, you can shade or check a place, which means, you’ve been there already! 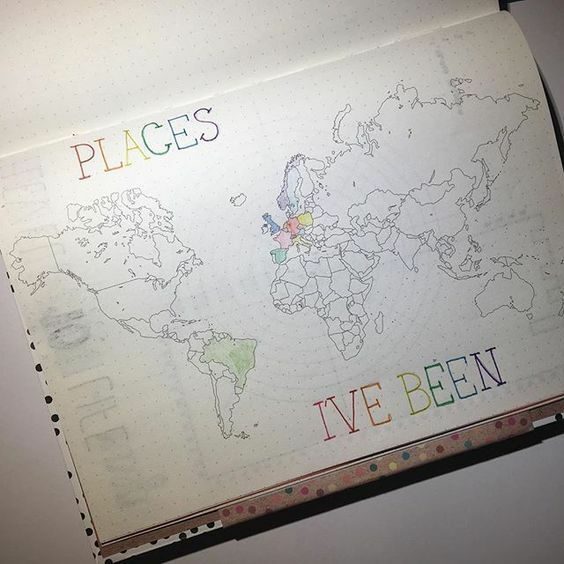 Those left uncolored are the places you are yet to visit. My motto when traveling is… Travel light. And I learned that if I want to travel light, I need to pack smart. 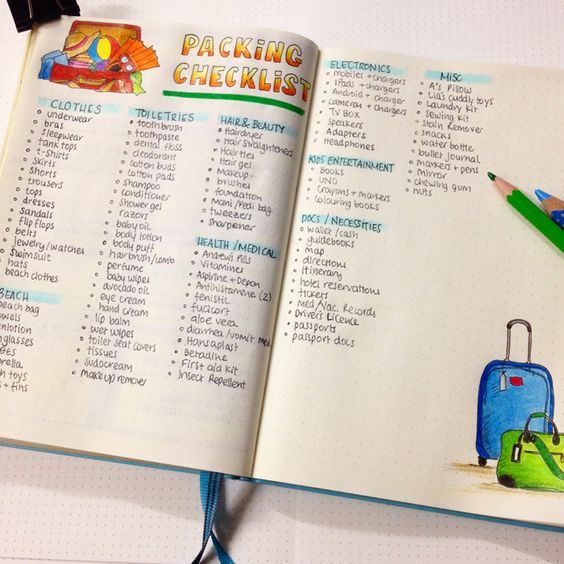 That’s where a packing checklist has proven itself useful over and over again. You’ll want to travel light. But you also want to have everything in your backpack. Just imagine having to hit the grocery store because you forget your… uh… slippers? And what if there’s no store nearby? Imagine the inconvenience. 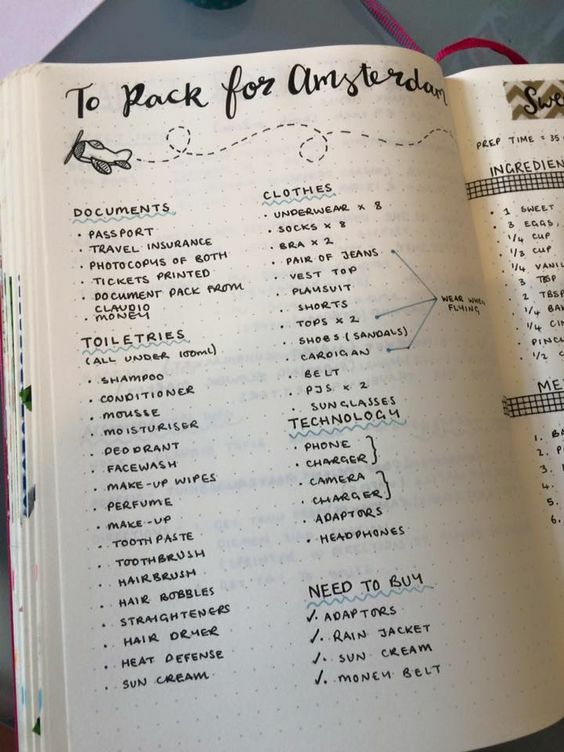 So do yourself a favor and list down everything you need for your travel! It does not only ensure that you have everything you need packed. But it also clarifies whether you really need to bring this or that. Like… do you really need to bring a shoe for every occasion? 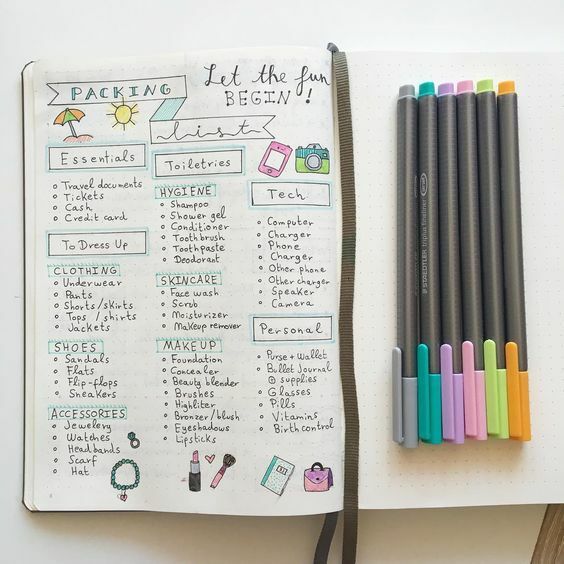 So whether your trip is for business or for leisure, don’t forget to add a packing checklist in your bullet journal. Remember the specifics of your trip – the taste of the new breakfast meal you tried, the feelings you had when you visited different places, the details of your South African safari. Maybe you enjoyed your trip so much that you’re thinking, I am definitely not going to forget this. 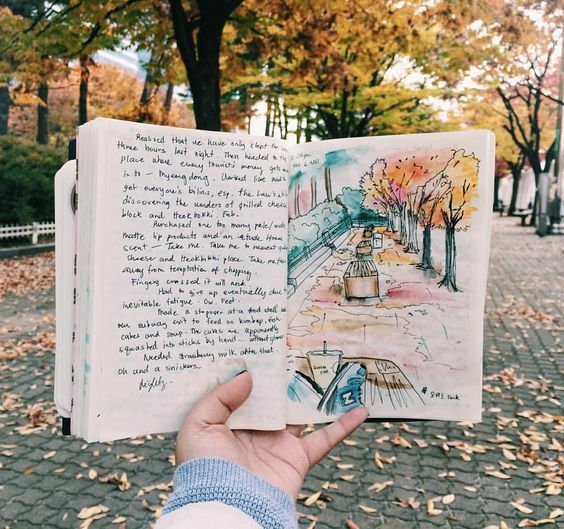 Even if you think and feel right now that you will never forget your recent trip, ten or twenty years from now, that memory may have already faded and your only chance of going back to those wonderful memories is your travel journal. 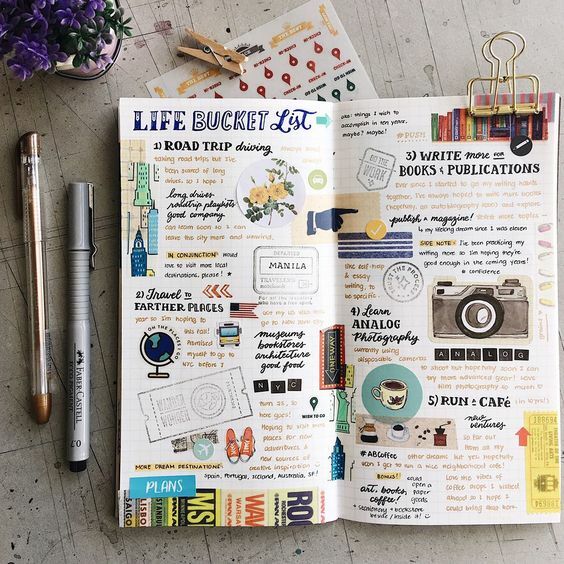 So take a page in your bullet journal and write down every memory of your travel, and relive those precious moments every time you open that page. Perhaps you want to take a vacation next summer with your family? Or you want to buy a new gift for your Mom? Whatever it is you need that need money, write it down. Doing so reminds you of your financial goals and it serves as a motivation for you to really strive to get it. Perhaps you need to work more hours in your job, or get more clients for your business to achieve your money goals. But because you know what it’s for, even if you have to work late at night for several weeks, you will not likely give up. And when you receive your money, you know that your efforts have paid off. 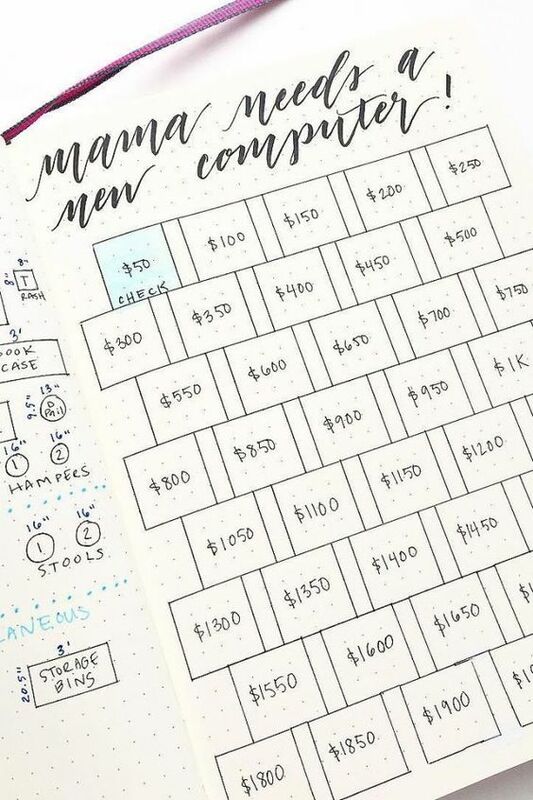 A monthly budget shows you how much cash you expect to earn for the month and how you plan to spend it. 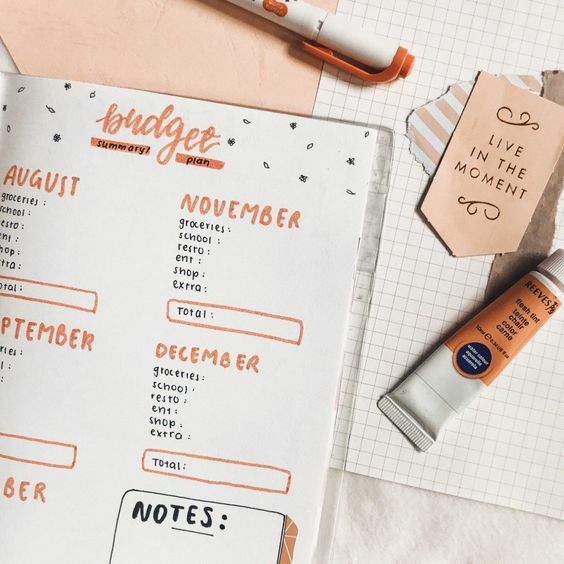 Without a budget, you can be careless on how you spend your money until you have nothing left in your pocket but still have lots of needs to fill. 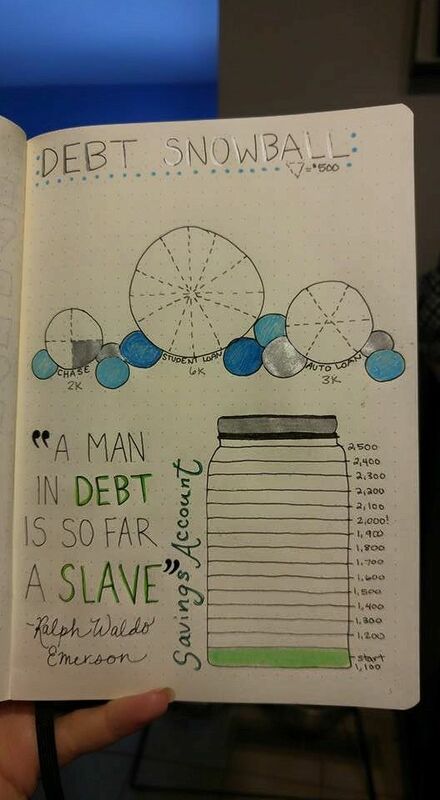 Spending money more than what you earn results in debt and… more debts. You don’t want to go this path. 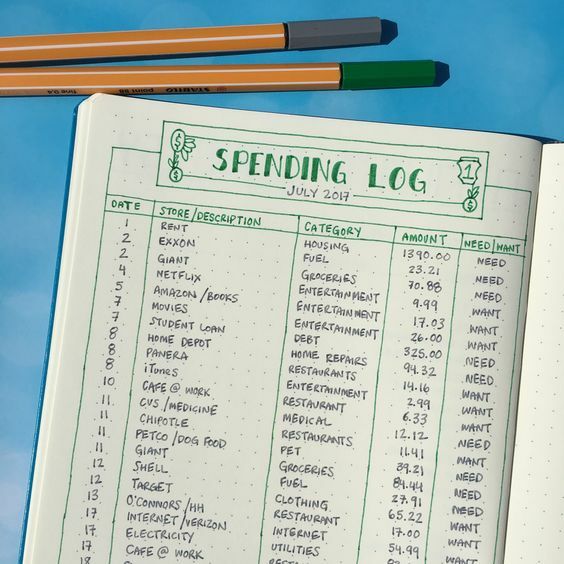 Using a budget, you can plan your expenses including your debt payments. It ensures that you have allotment for every need, without going beyond your means. You’ll also have a preview of how much you can save and invest. It’s not about the money you earn, but the money you keep. 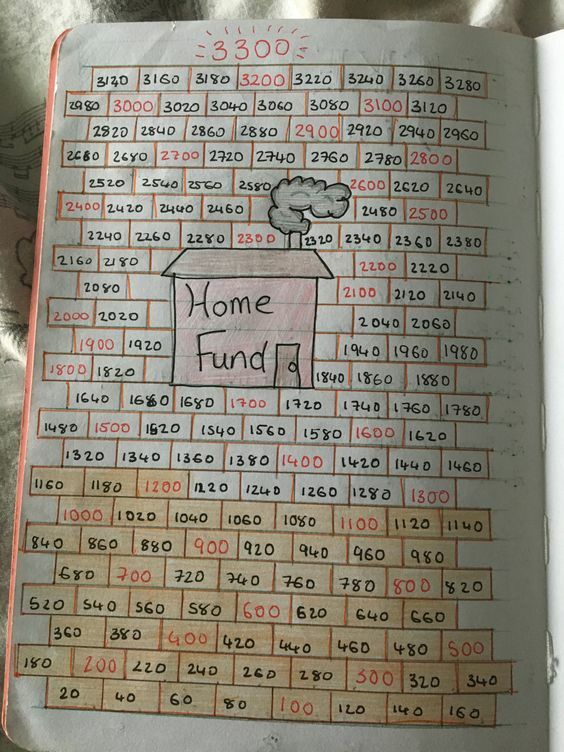 Saving money has many uses – either for home improvement, for emergency, or for investing so that later on, you don’t work for money anymore but money works for you. 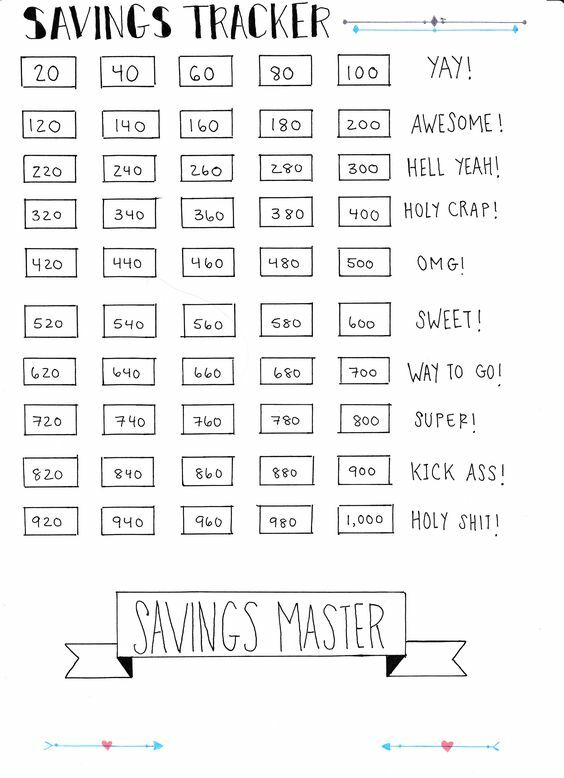 Monitoring your savings, seeing those numbers go up is very motivating especially if you are not the saver type. 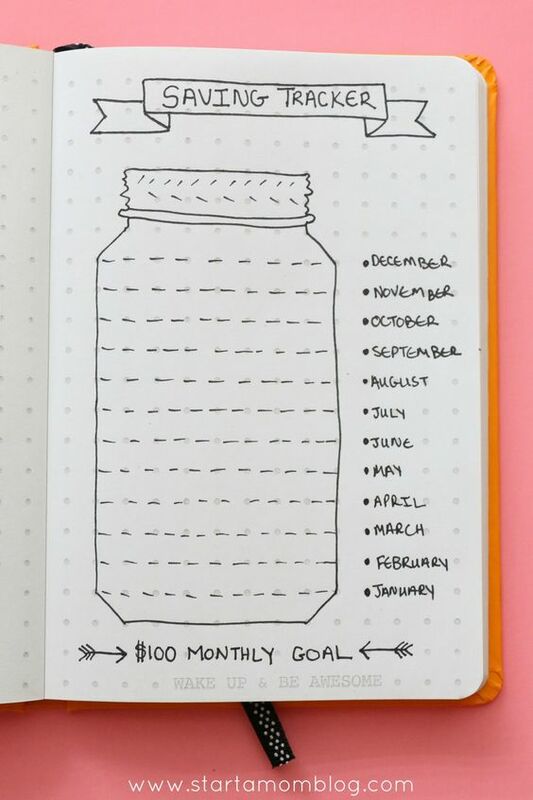 To do this, figure out how much money you need to save every month. Just write whatever amount it is. When you receive your paycheck, take this out first and keep it safe, then you can spend the rest of your money. Seriously… if you want to be able to save money, do not wait for what remains in your wallet after spending. Because believe me… nothing will remain. And do not touch it, unless you will use it already for whatever purpose you were saving it. 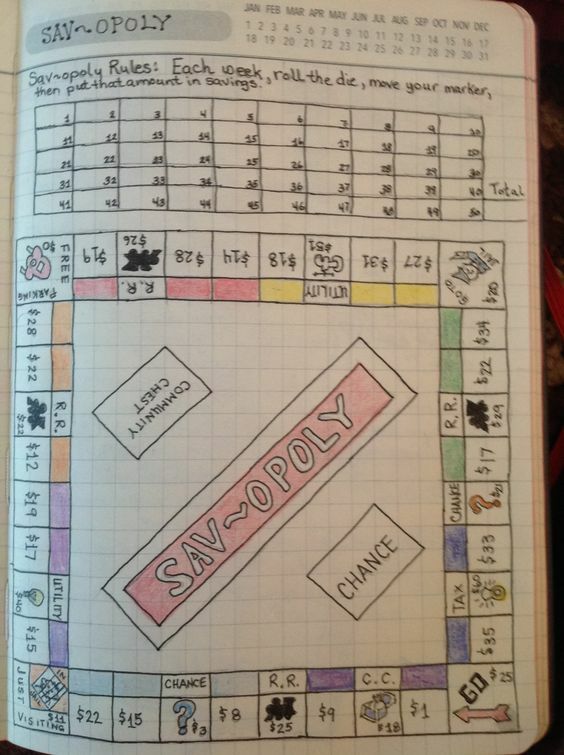 If you don’t want your savings to be a fixed amount every month, you can try Savopoly to determine how much you should save each month. It’s gonna be real fun! Now, fixed amount or not, it doesn’t matter. Feel free to choose how you want it. The important thing is you save money consistently. 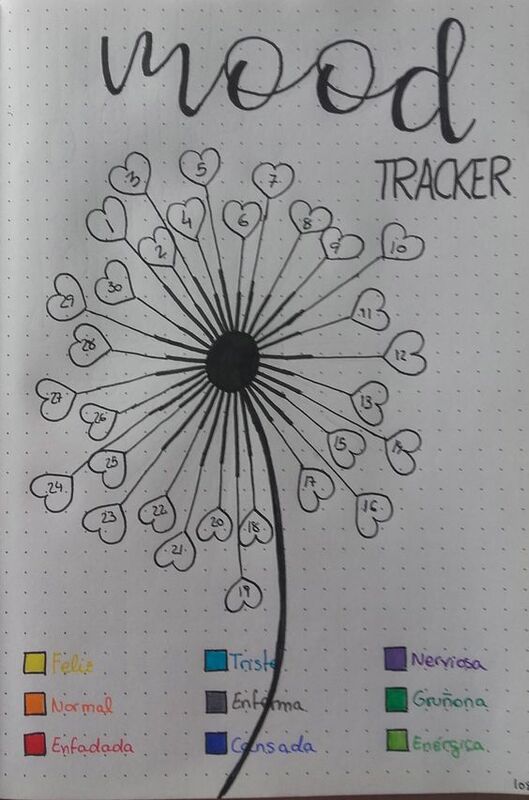 Get to know how much really are your debts in just one look by making a debt payment tracker! As you pay each month, calculate how much remains on each of your debts. You can simply write down the numbers. But if you want to be a little creative, you can use a line graph, a pie chart, a bar graph and any other illustration you can think of. Seeing your debts become smaller and smaller every month feels good, which makes it a great way to motivate yourself to continue paying until you have zero debt. Monitor your bills. Take note of when each is due and never miss a payment! Having a bill tracker reminds you of the bills you have to pay and their due dates. Paying before or on time will help you avoid unnecessary penalty and charges. Imagine being charged just because you forgot your due date! You could have saved that money or used it to purchase some needs. 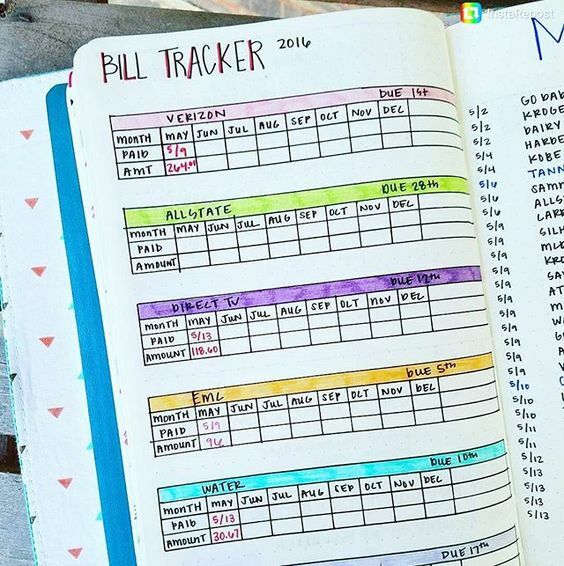 Why pay extra when you can avoid it by having a bills tracker? Now every time you pay, include the date and the payment amount. This serves as a confirmation for yourself that you have indeed paid your bill already. Be sure to keep and organize your receipts. 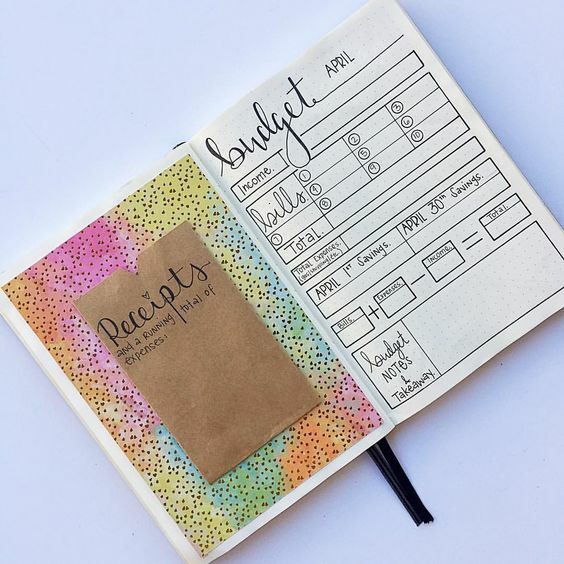 Even if you have a record in your bullet journal, your receipts are still your solid proof that you have indeed paid your bills already. You can use them also when tax time comes. If you’re using credit card, these receipts will confirm if the credit card company charged you correctly. 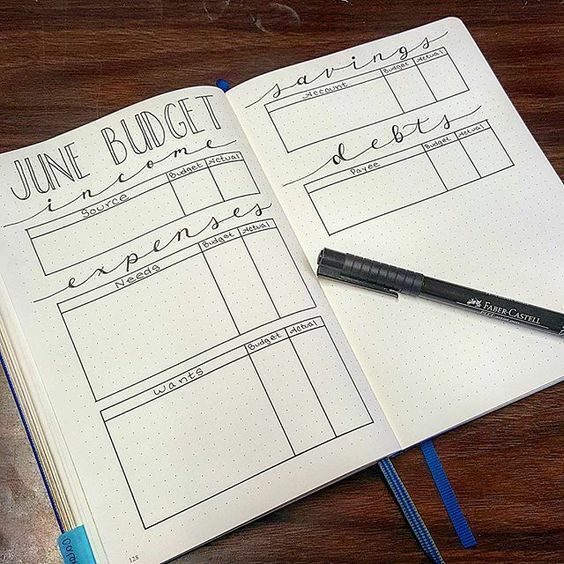 Creating a monthly budget is one thing. But sticking to it is another. 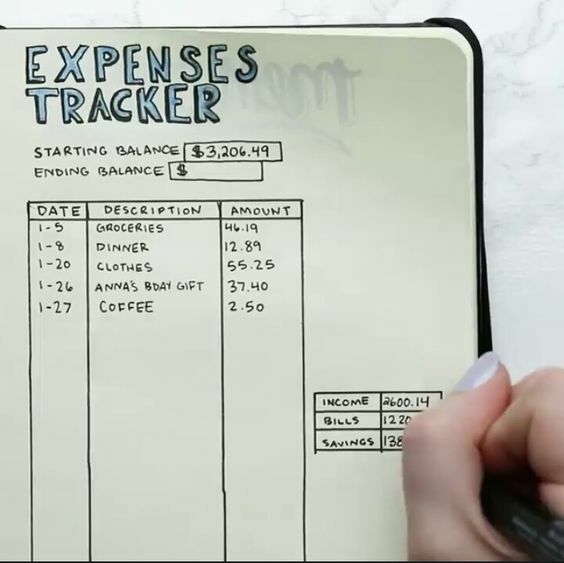 To ensure that you’re sticking to your budget, start tracking your expenses. 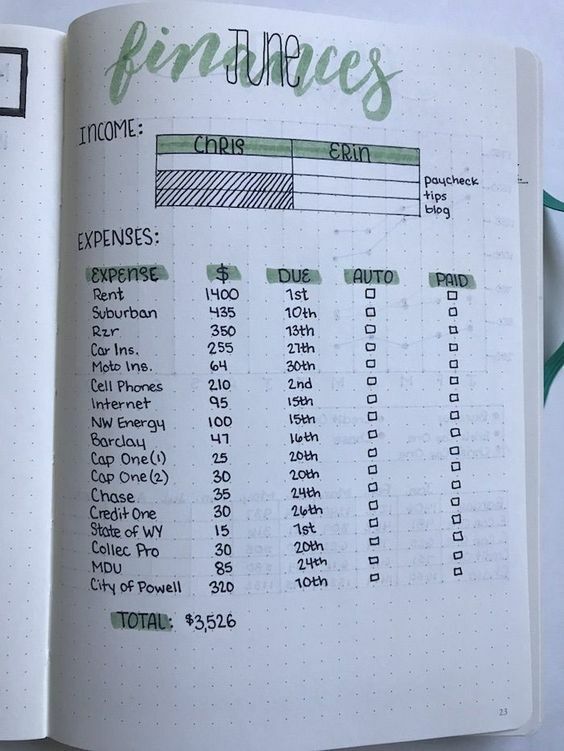 Doing so will help you evaluate how much you are spending on food, clothing, transportation, special occasions and other expenses. This will help you see whether your budget for each was too much, not enough, or just right. This also shows you where your money is actually going. At the end of the month it is easier to evaluate whether you spent your money on real needs or on mere wants masquerading as needs. This will give you a clear idea on the things that you can cut back on so that you’ll have money to pay your debts, to save or to invest. When you have money in your pocket, it’s so tempting to eat dinner out and buy new clothes. But if you want to save money to get out of debt, or save for future expenses, or for investing, you need to exercise control. 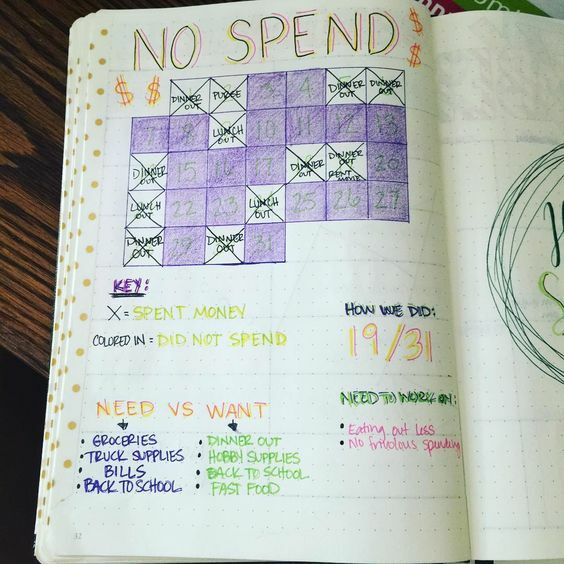 A No Spend Challenge is one way to do that. 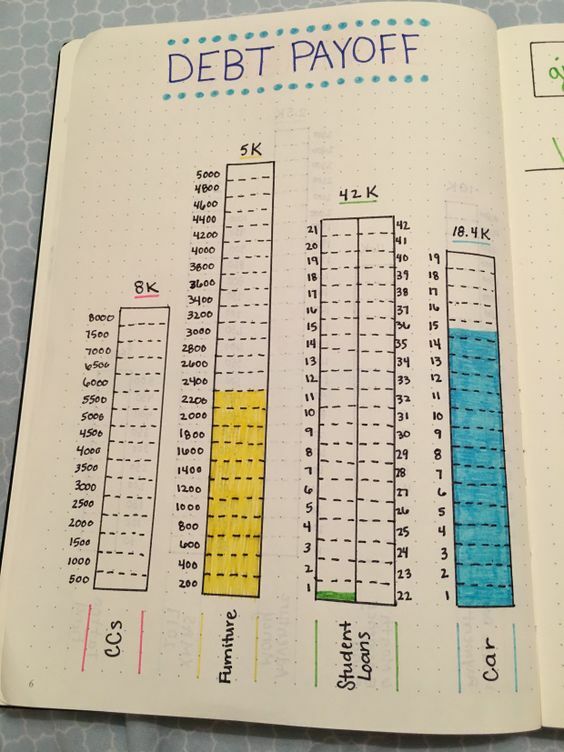 Monitor your progress by tracking it in your bullet journal. 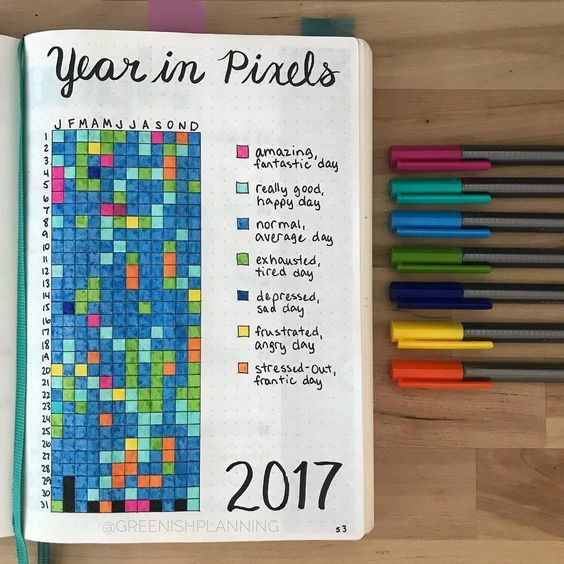 By rewarding yourself with those checks and colors in boxes, you can see how much you are progressing. This alone is gratifying and will help you maintain the discipline of not spending money on unnecessary things. 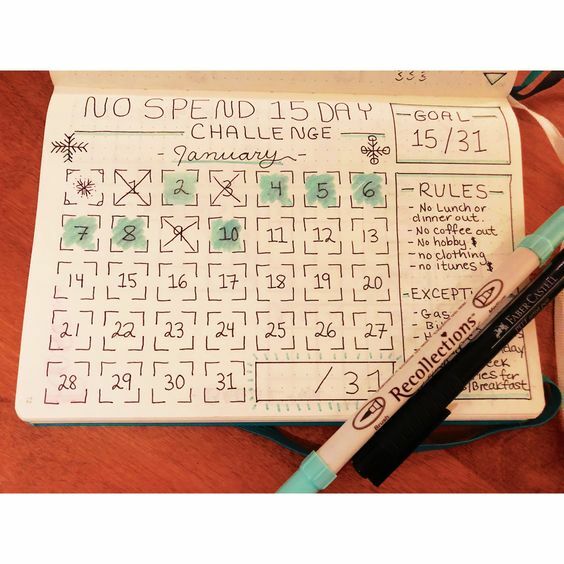 You’ll feel even better when you see how much you are saving each day because of this challenge. 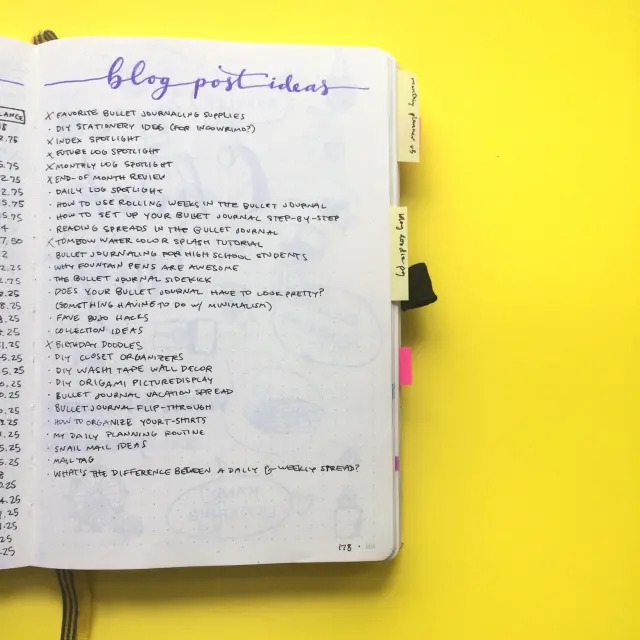 Constantly thinking of what to write next can be daunting, especially if you are a beginner blogger. 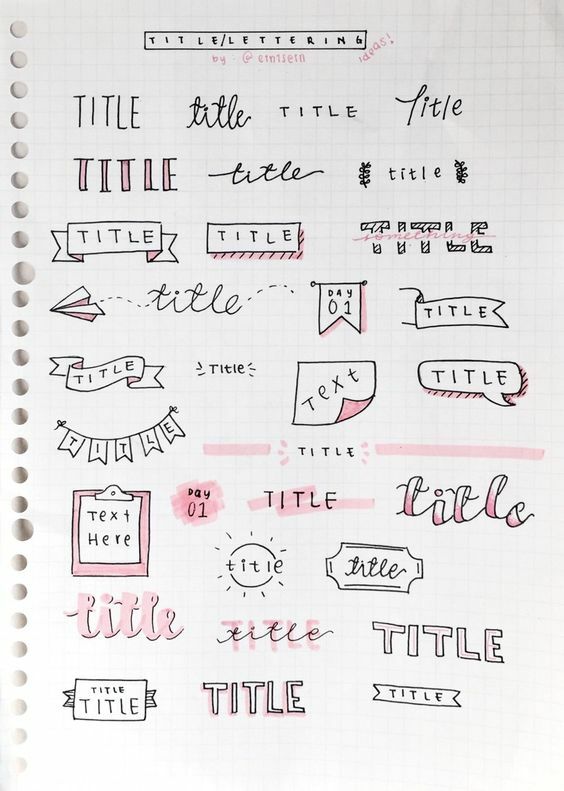 So it’s pretty helpful if you compile a list of blog post ideas. Then when you are ready for your next entry, you don’t have to think what to write about. 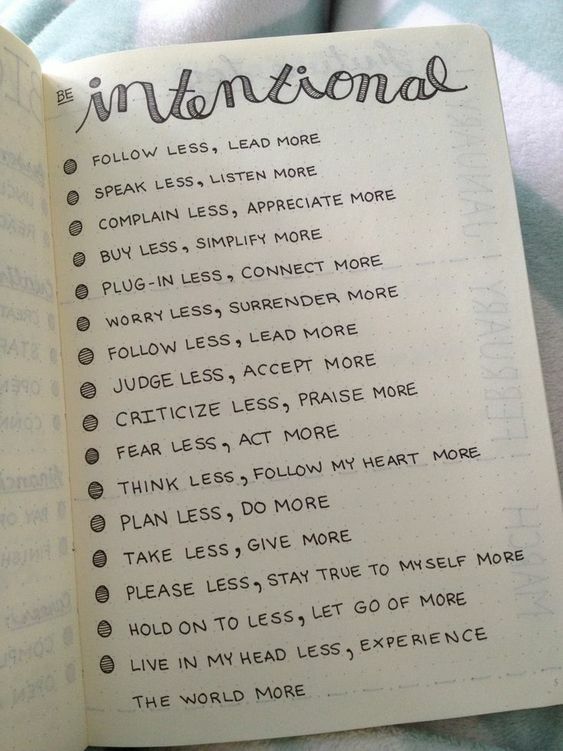 Just choose among your list. If you’re blogging as a hobby, you have nothing to worry about getting an audience. You can write about just anything that comes to mind. It’s just a hobby anyway and you’re doing it just for leisure. But if you are someone who wants to blog because you want to earn money from it, you’ve got to approach blogging differently. If you want your blog to be successful, you need an audience. And for that audience to come to you, you need to write about topics that they are interested in. Now here comes the tricky part about blog posts. Just because you think you love a topic, doesn’t mean there will be a lot of people who will love it too. This has been a struggle for me too. But with research and lots and lots of practice, I’m slowly getting it. But there is still a lot for me to learn. 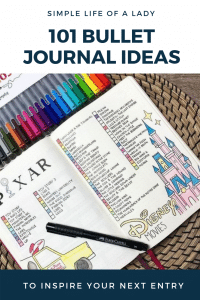 Now I’d love to share with you these three articles that serve as my guide into coming up with contents that will likely resonate with my audience. 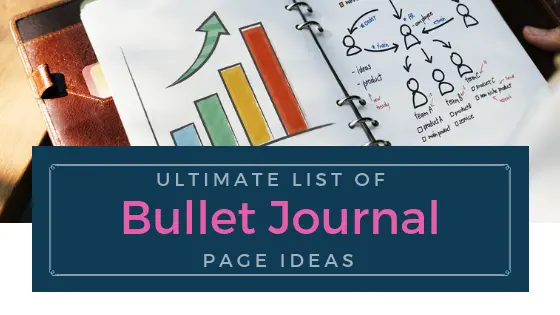 So before you fill your bullet journal with blog post ideas, it won’t hurt to read these first, and have a greater chance at success. If you want something more comprehensive, here’s a blogging bootcamp that you can join. It’s totally free! Joining this bootcamp has helped me launch this site (without any other resource in my hand, and without any experience in blogging). 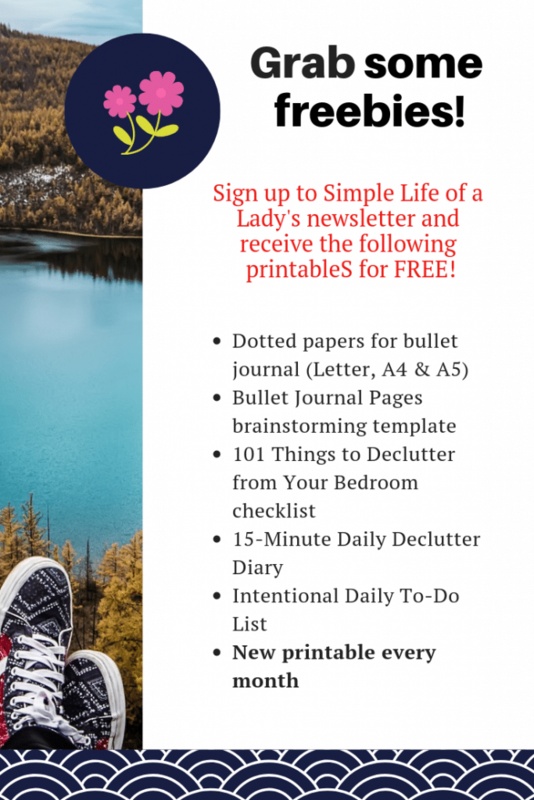 So I can’t help but recommend this amazing freebie to you. Now here’s a page for tracking your blog’s pageviews, subscribers, followers and income. Again, to be successful in blogging, you need people to like what you write. What better way to know whether people like your blog than your statistics? What appears in your statistics is enough feedback for you to know whether you are going into the right direction, or you need to change things up. If you want SEO and Pinterest bootcamps too, here they are! Again, these are free to join. 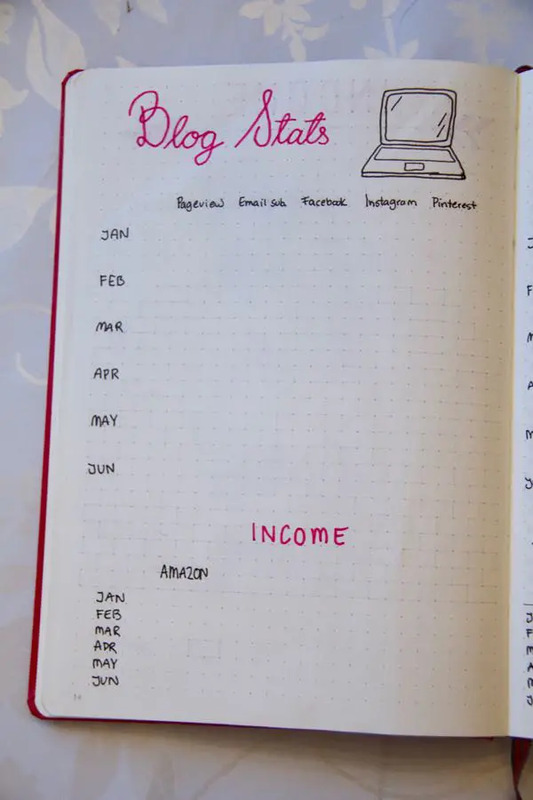 I’ll also include my favorite resource in affiliate marketing, just in case you are interested how bloggers earn from it, and how you can too! 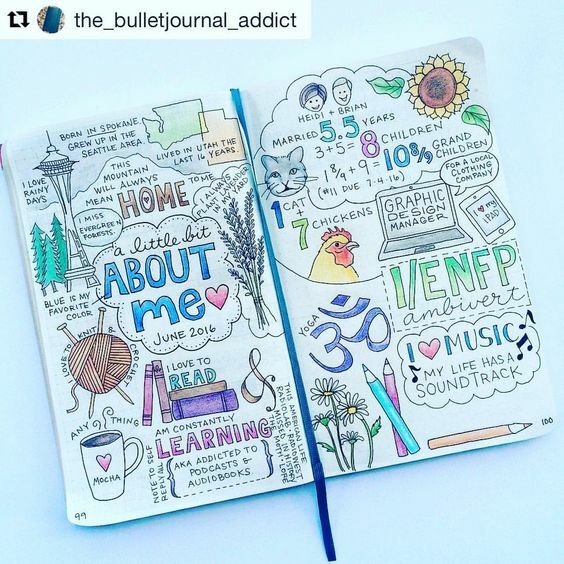 This ends my post on bullet journal ideas. If you haven’t seen the first part yet, here’s the link to that. I hope you were able to take a lot of ideas from these two posts! 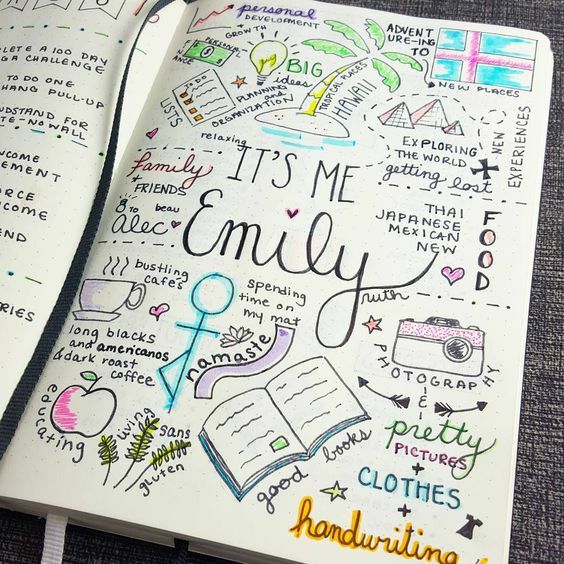 Cheers to the amazing bullet journal you are making! May it help you become the best version of who you are! Loved this post? Share the love and PIN it so that others will know about it too!